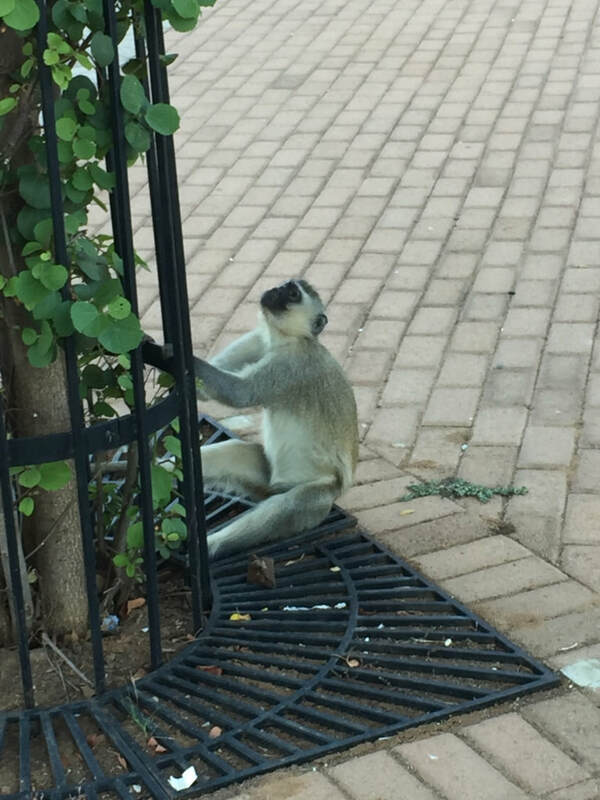 The monkeys are busy scampering across campus and wrestling with each other. Sleepy Gabs is even sleepier as pretty much everyone has cleared out of the city and headed home to their villages for the four-day Easter weekend. This week was a farewell tour with Tess, my Fulbright DAT colleague. 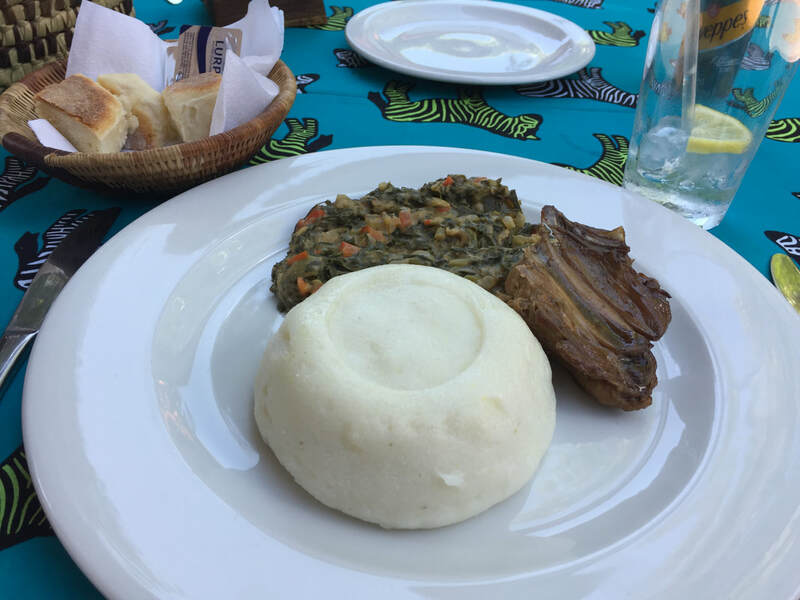 We had a last Botswanacraft lunch, a last visit to the Sierra Leonean tailor K-Man at African Mall and a last Sanita's lunch, all in the company of her delightful friend Mandisa from South Africa. After a bit of final hours stress when her Air Botswana flight was unexpectedly cancelled, she was able to be rescheduled onto a South African Airways flight from Gabs to Joburg and is now somewhere high over the Atlantic on her way home to Chicago, where she'll be back in the classroom with her learners on Tuesday. Already missing my intelligent, inquisitive, multilingual, fearless partner. 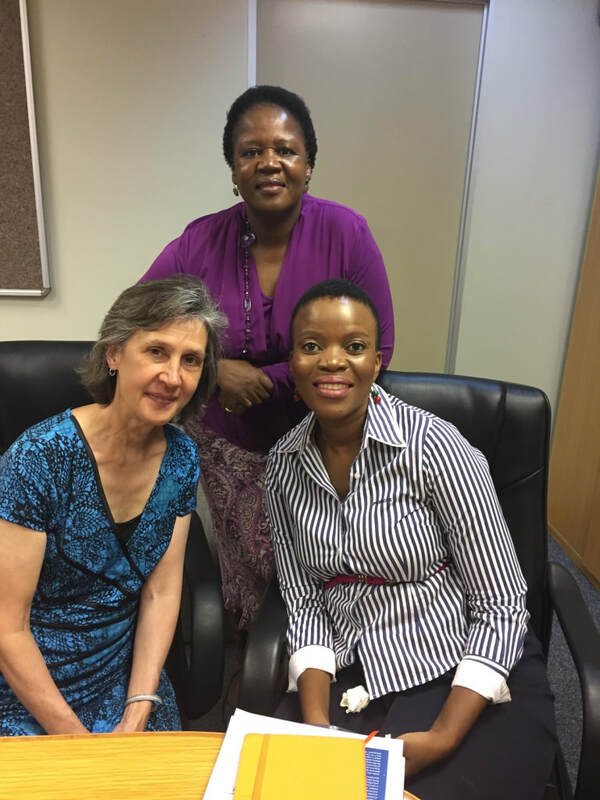 This week I interviewed Wame and Senzeni from BOFWA (Botswana Family Welfare Association). 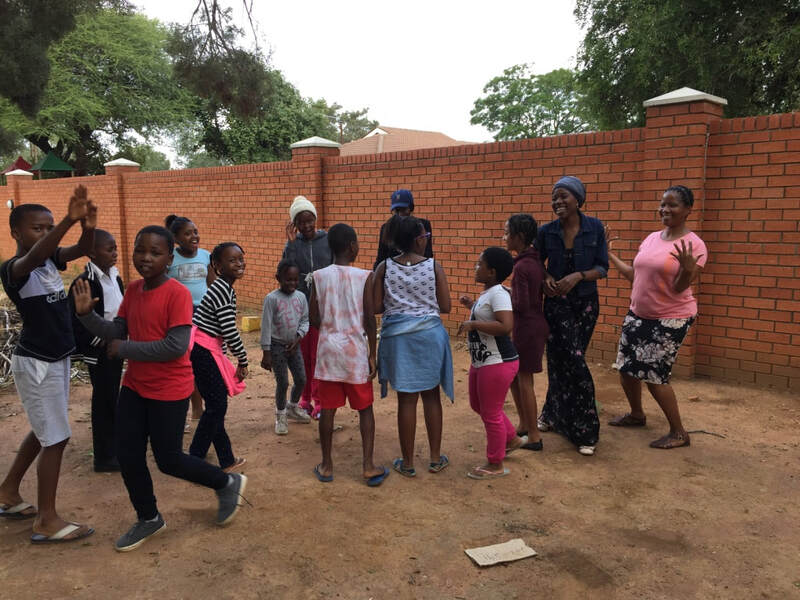 BOFWA provides sexual and reproductive health education, advocacy and clinical services, targeting marginalized youth in Gaborone, Kanye, Maun, Kasane and Francistown. The Guardian article How To Grapple With Soaring World Population? An Answer From Botswana explains that family planning efforts on the part of the Botswana government and NGOs like BOFWA have contributed to a reduction in Botswana's fertility rate from 6.5 in 1971 to 2.8 in 2011. There is still an unmet need for family planning, particularly in rural areas and among low income groups and teens. The first step for anyone interested in accessing any of BOFWA's clinical services is an HIV test. Botswana has one of the highest rates of HIV/AIDS infections in the world, even with the provision of free ARV (antiretroviral) meds to all. Stigma remains. Some people avoid testing, do not know their status and pass on the virus. 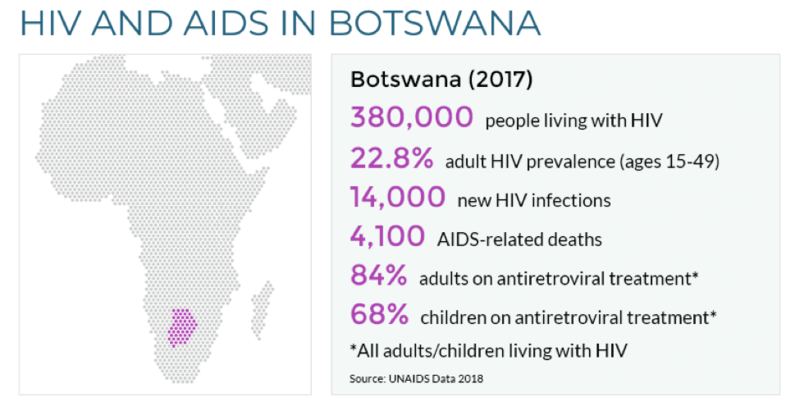 HIV/AIDS message fatigue, typical risky behaviors of youth, the belief that AIDS is no longer a death sentence, high unemployment and particulars of Botswana dating culture also continue to fuel new infections. Can you spot iTowers on the Gabs skyline? On Tuesday I met with Olerato of Sentabale in an office in the highest building in Gabs, iTowers. 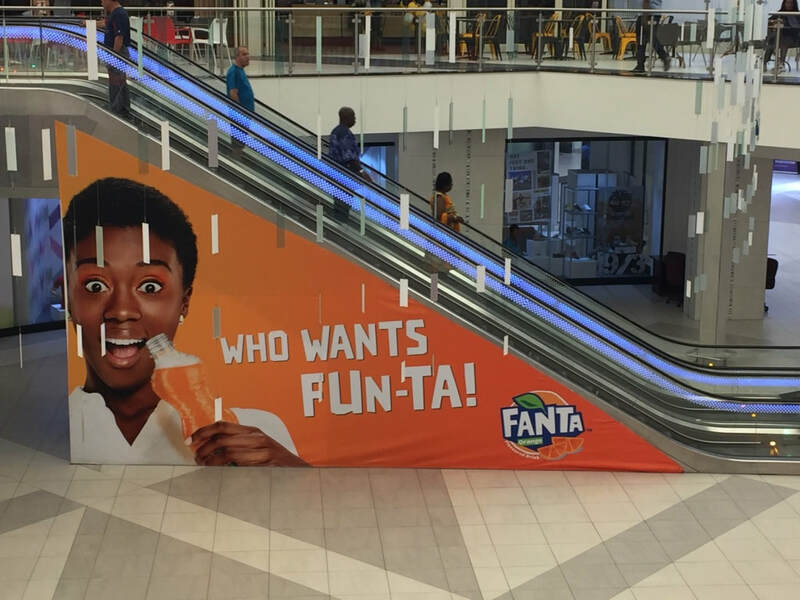 Sentabale works in both Botswana and Lesotho and focuses on meeting the material and psychological needs of HIV positive youth and on providing a forum for youth voice and leadership regarding HIV/AIDS issues. Sentabale was founded by Prince Harry, Duke of Sussex and Prince Seeiso of Lesotho. 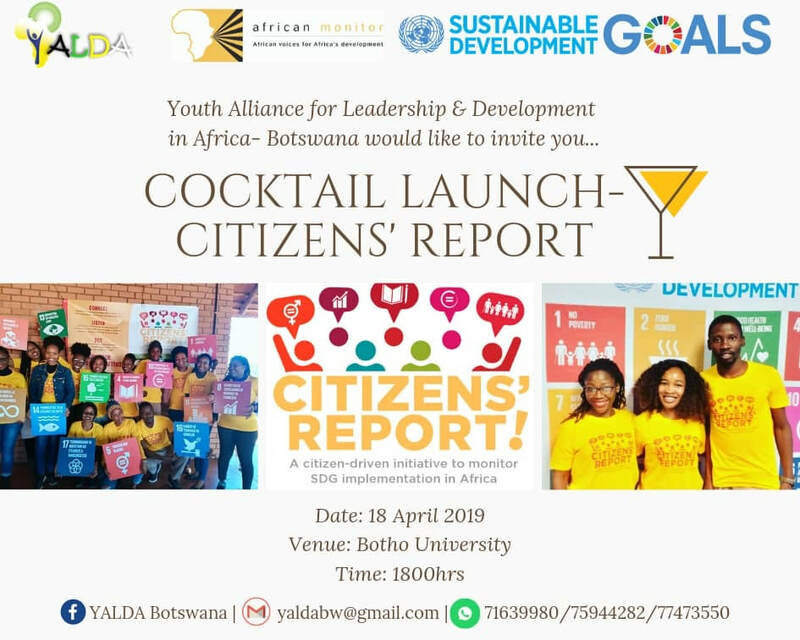 Thursday evening I attended a "Cocktail Launch" for YALDA's Citizen's Report at Botho University with Tebatso and two other Banabakgwale Association members. I was really looking forward to the event because the agenda included a panel with representatives of government, education and NGOs speaking about United Nations Sustainable Development Goal (SDG) implementation in Botswana. A perfect fit with my project! Just as they launched into the panel discussion portion of the program, goodbye English and hello Setswana. Argh! Hoping to see a copy of YALDA's Citizen's Report (in English) soon. Week 11: "We Are Motivated By People With a Story"
This week included UB classes, interviews, a few mango and moringa seedlings planted, a litter clean-up and a spectacular show of national pride. On Monday I met with Charity of Botswana Network for Mental Health. My goal was to learn about the work she is doing to support in-school youth, out-of-school youth and unemployed youth. Like so many young Batswana, Charity has a passion and a strong work ethic, yet little to no funding for her work. 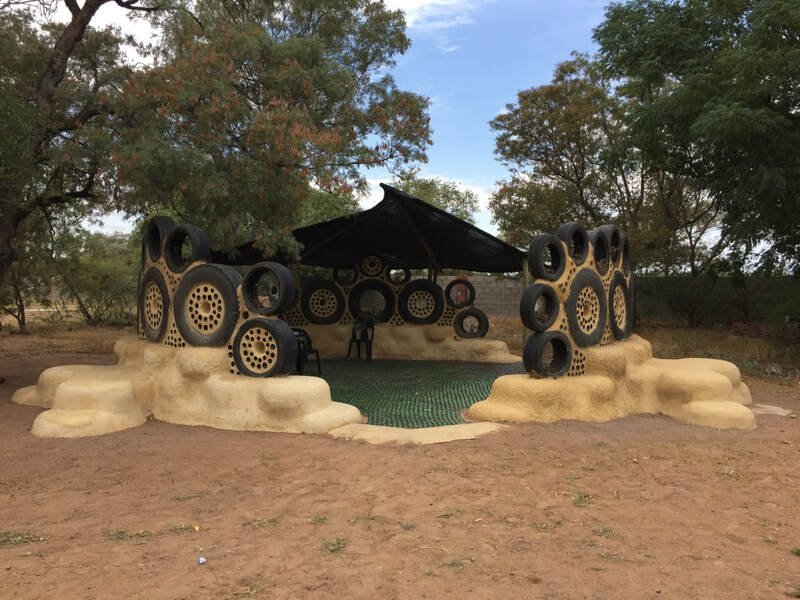 Specific to the Botswana setting, youth struggle with mental health issues related to HIV/AIDS, gender based violence, test anxiety (exam scores determine secondary school access and government sponsorship for post-secondary education), and job seeking. 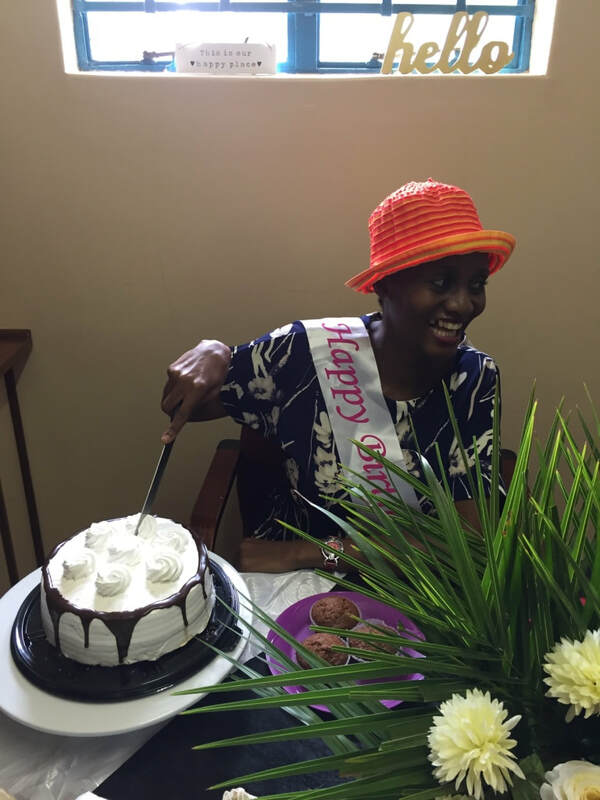 Charity’s awareness raising and advocacy work aims to reduce stigma associated with mental health issues and to improve mental health education in order to build psychological resilience in youth. 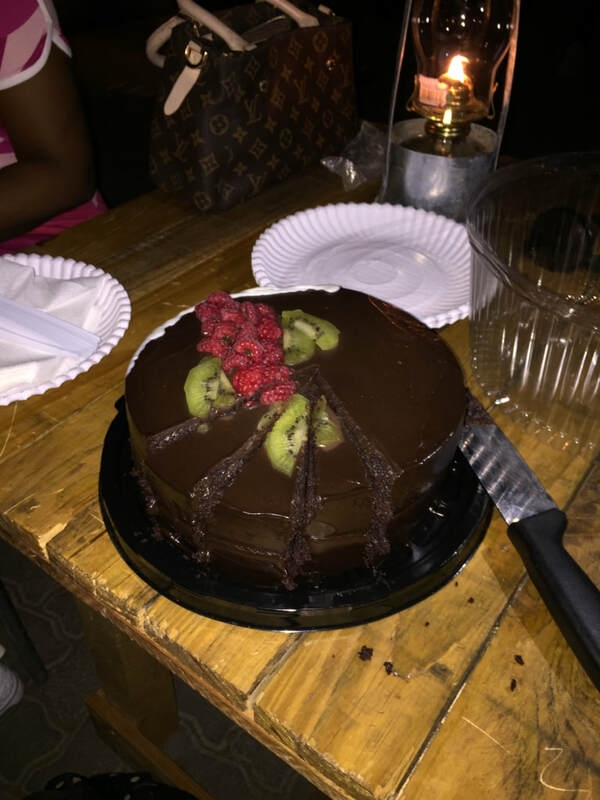 Charity began our conversation by sharing her personal struggle with depression. 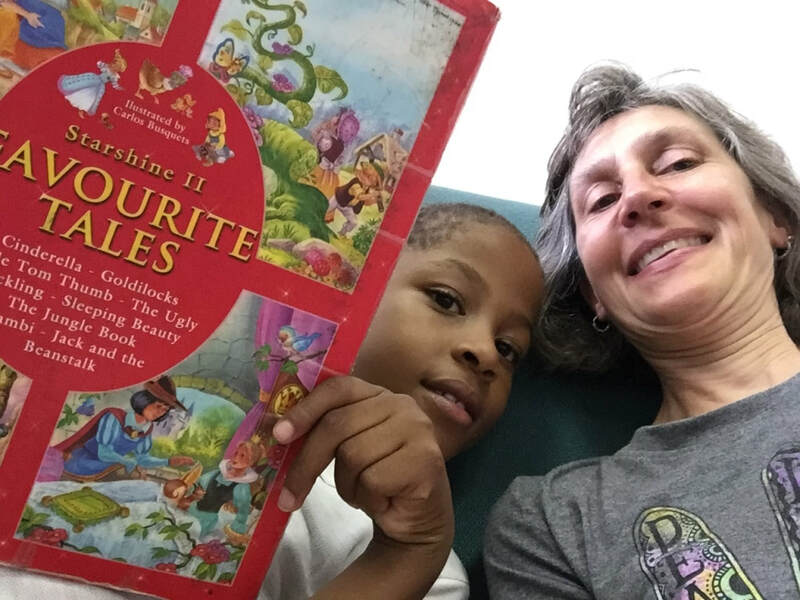 In her words, she shares openly because she has found that “we are motivated by people with a story”. A session Charity led for BW Jobs 4 Graduates, a NGO that I will meet with this week. Botswana's high youth unemployment rate has an impact on youth mental health. ​On Tuesday I interviewed Tshepo of the Botswana Student Network. 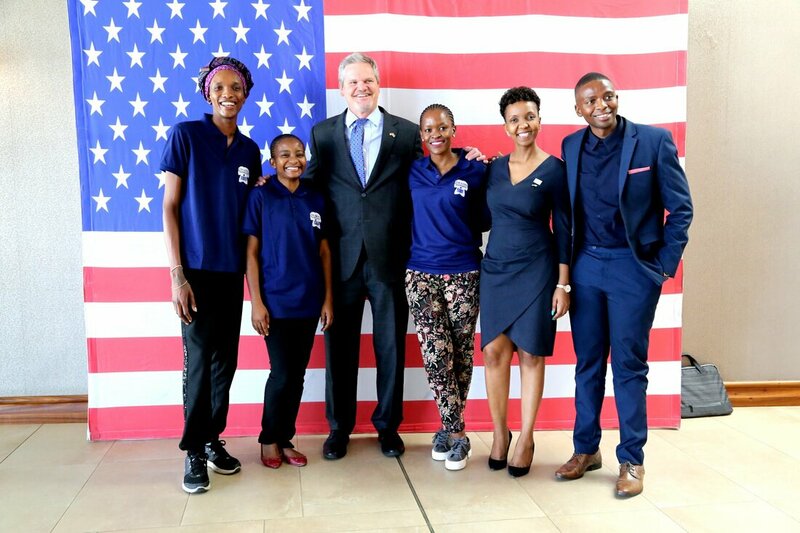 The Botswana Student Network connects youth to government, business and community organizations to network and serve. Tshepo is also someone with a story that motivates his work. 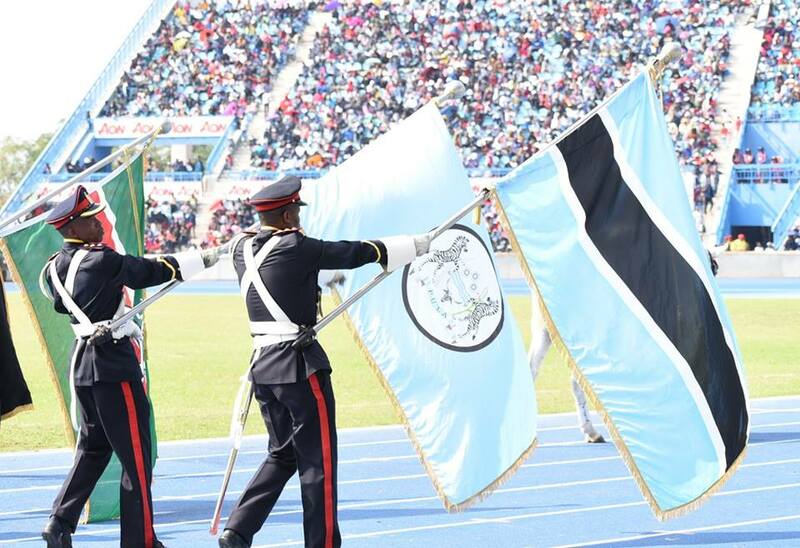 He scored poorly on his exams at the end of Form 5 (equivalent to U.S. grade 12) and therefore did not qualify for Botswana government sponsorship of his post-secondary education. His family sponsored him to go to Cyprus for university, where he excelled in a setting less focused on memorization and more focused on application and had his eyes opened to a wider world. 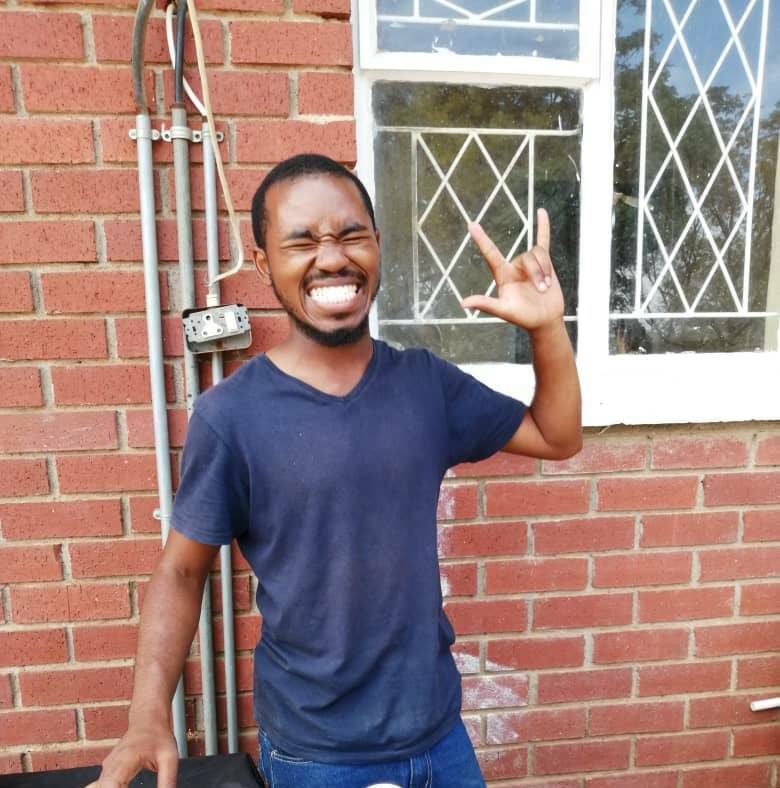 Due to financial constraints he returned home to Botswana after two semesters dedicated to helping youth who may have difficulty passing exams, but do have skills and talents that they can develop to find purpose in their lives and support themselves economically. 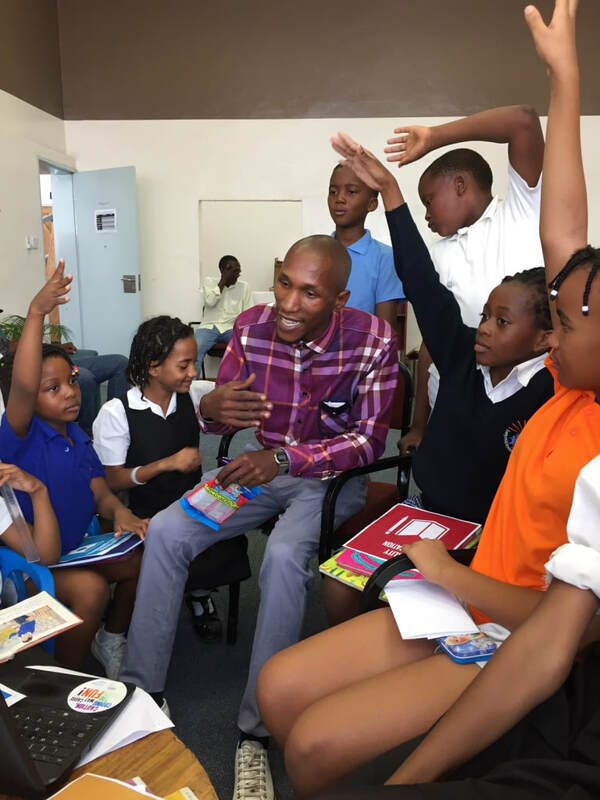 Tshepo explained that young Batswana who do not move on to Senior Secondary school or university may become discouraged, not see a path to life success, have children at a young age and continue a cycle of poverty. 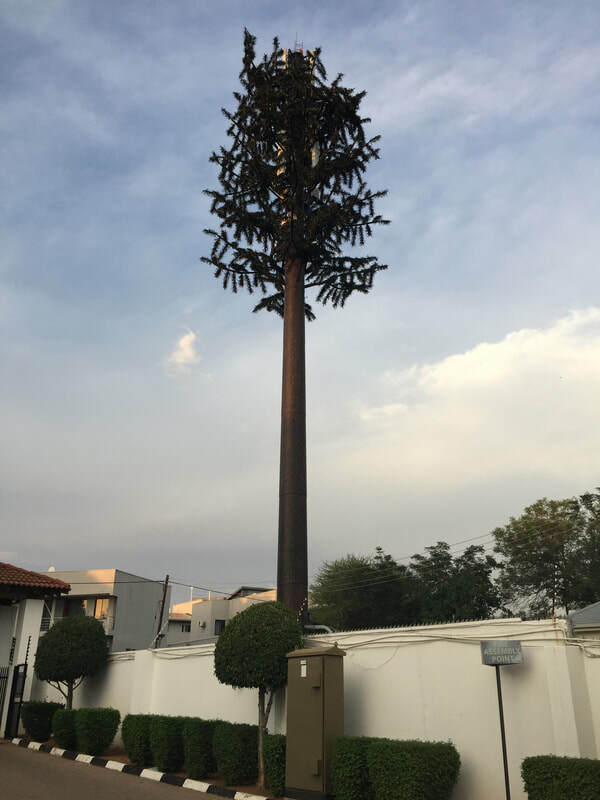 Tuesday I was also at the United Nations building in Gaborone’s government enclave to interview Boago of the United Nations Population Fund (UNFPA). 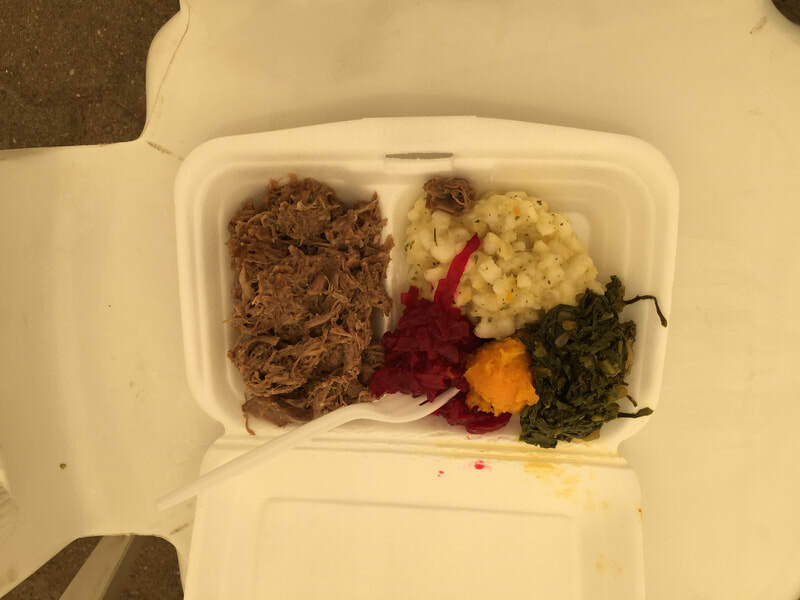 This was a connection that I was able to make thanks to Rebecca Kubanji of the UB Population Studies Department. As a United Nations fan, it was fun just to be in the building! 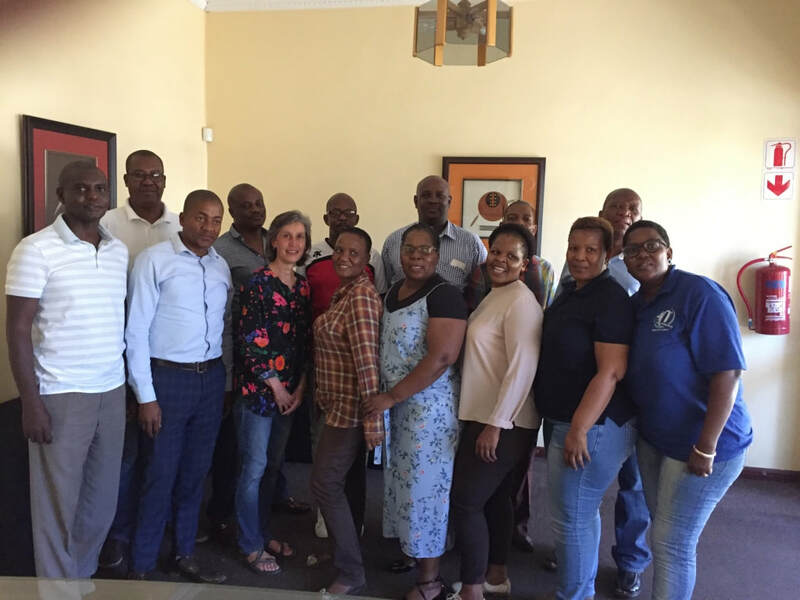 UNFPA work in Botswana focuses on family planning, maternal health and HIV/AIDS with a special concern for gender equality, human rights and youth. Our discussion focused on demographic dividend and U.N. Sustainable Development Goal (SDG) issues, in particular populations that continue to have an unmet need for family planning (low income, rural, teens and HIV/AIDS infected), Botswana’s stubbornly high maternal mortality ratio and the need for alignment of data collection and storage so that consistent analysis can be done at the global, regional and local scale by the United Nations, African Union, Southern African Development Community (SADC) and Botswana government. As a Human Geography teacher, it is interesting to be in a place where people and organizations talk consistently and positively about population policy and development partners. As far as I know, the U.S. does not have a “population policy”, just partisan bickering about family planning, abortion rights and immigration. The U.S. and Russia are the two countries doing the least to implement the SDGs at the national level. In the Trump era, some states and cities are stepping up to fill the federal void. Friday was the weekly Banabakgwale SDGs Seminar for kids. 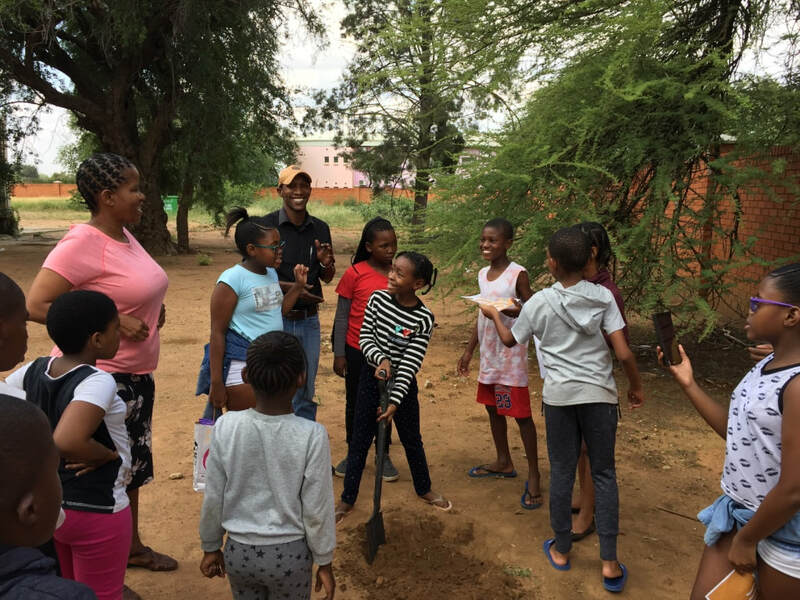 Tebatso brought mango and moringa seedings for the kids to help plant as a 2019 Global Youth Service Day activity. On Saturday, he and his Banabakgwale colleagues organized speakers and a litter pick for high school and college aged youth. 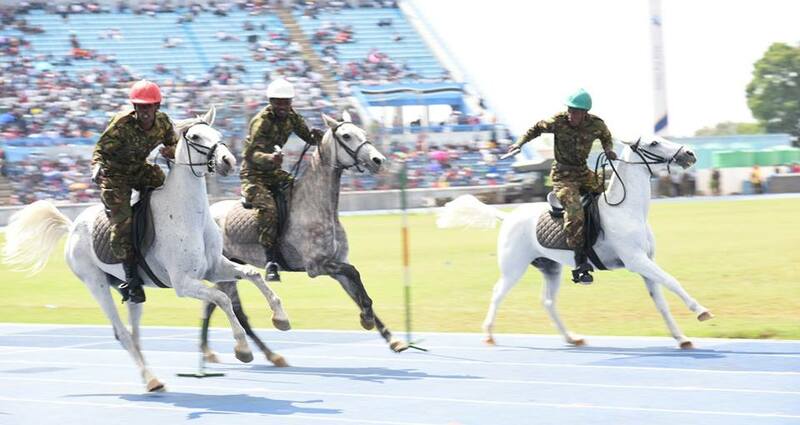 The spectacular show of national pride was Saturday’s Botswana Defence Force (BDF) Day at the National Stadium near UB. 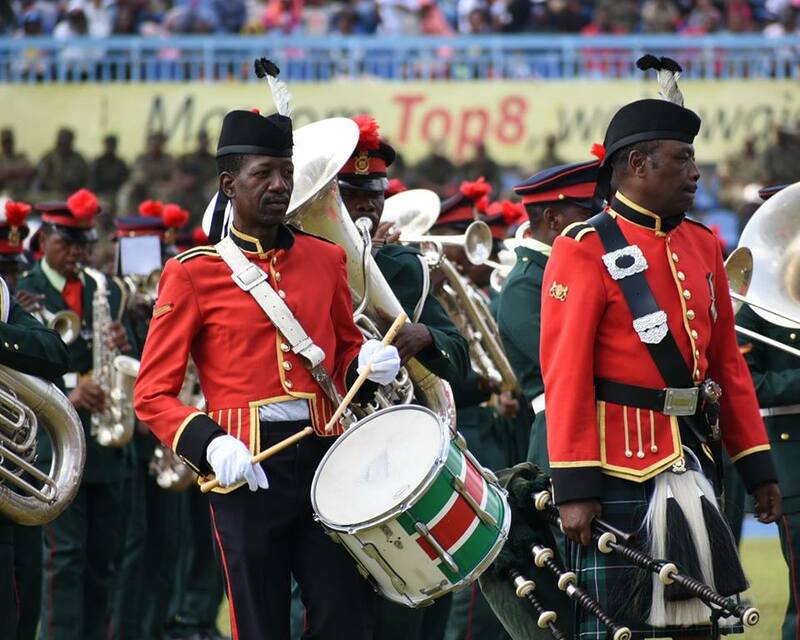 President Masisi and former President Ian Khama were in attendance and it was quite the event. 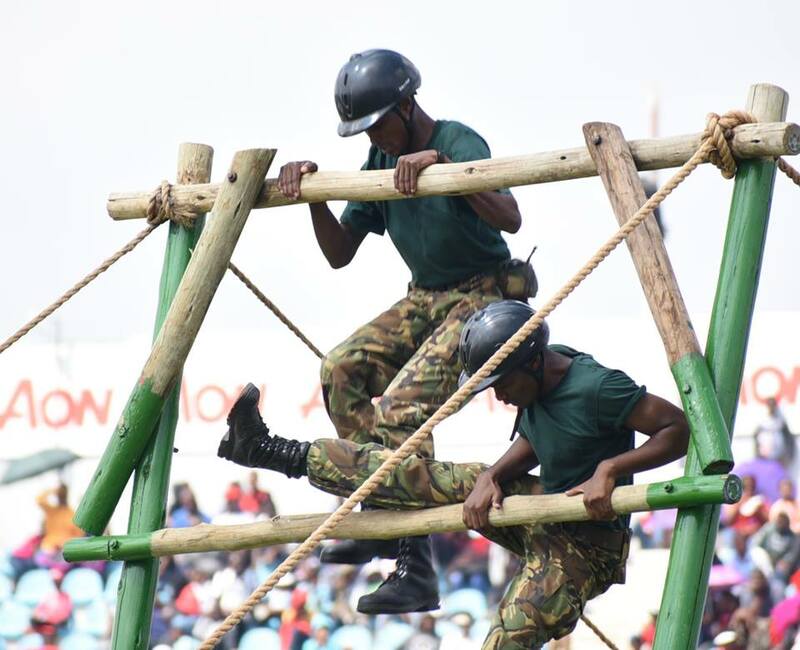 Marching bands, dancers and singers, canine, horse, tug of war and obstacle course competitions between military branches, a “drama” in which the BDF saved the day, soldiers rappelling from the huge stadium light fixtures and flyovers by military helicopters, cargo planes and combat planes. 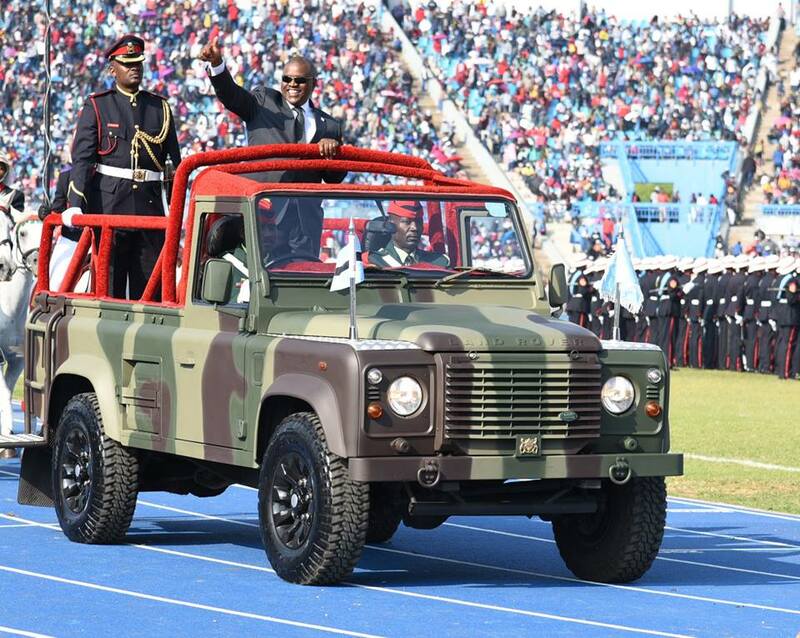 ​ Pictures below, courtesy of Botswana government photographers. Week 10: "Young Africa Botswana"
Botswana is finally transitioning from summer to winter (i.e. slightly cooler temps), which is really refreshing. I actually wore a sweatshirt for the first time yesterday. I'm transitioning too, from the initial weeks and months of my Fulbright DAT program that felt more academic and theoretical, to the final weeks and months which are feeling a whole lot more practical. 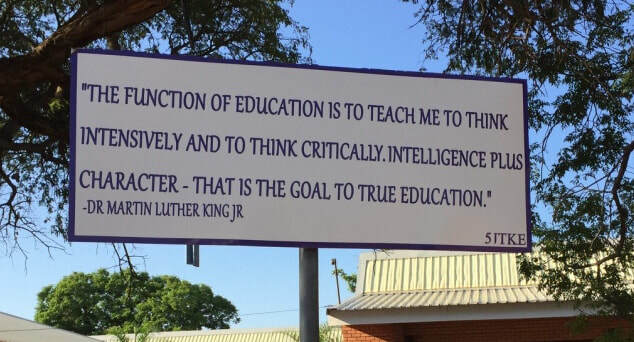 The idea that Botswana primary, secondary and tertiary education focuses too much on the theoretical and too little on the practical is a recurring theme hammered home in nearly every formal and informal conversation I've had. Many learners emerge from their schooling lacking the technical and soft skills needed for workplace success. This week I met with three impressive young Batswana: Lillian of Career Coaching, Omphile of All Brilliant Minds and Timothy of Young Africa Botswana. What these young people and their organizations are doing (on absolutely shoestring budgets), is attempting to fill gaps that they have identified in the educational system and in government youth employment schemes. Career Coaching provides personal professional development consulting, All Brilliant Minds (ALBRIMO) motivates and tutors secondary students and Young Africa Botswana offers TVET (Technical and Vocational Education and Training) that embeds entrepreneurship and life skills. 2018 Mandela Washington Fellows at Human Trafficking in Botswana Youth Conference. Lillian is second from left. Lillian invited me to sit in on this evening seminar. Three presenters helped participants better understand the Generation Z learner. Omphile of All Brilliant Minds. 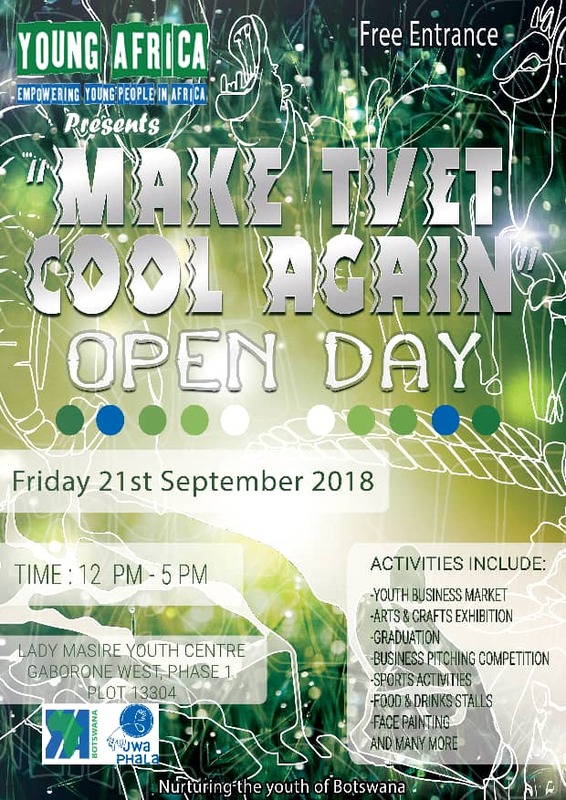 A speech given by EU Ambassador to Botswana and SADC Jan Sadek at the launch for Young Africa Botswana's "Make TVET Cool Again" campaign details the connections between Botswana's demographics and the need for high quality TVET to address the skills mismatch that is one contributor to Botswana's high youth unemployment rate. 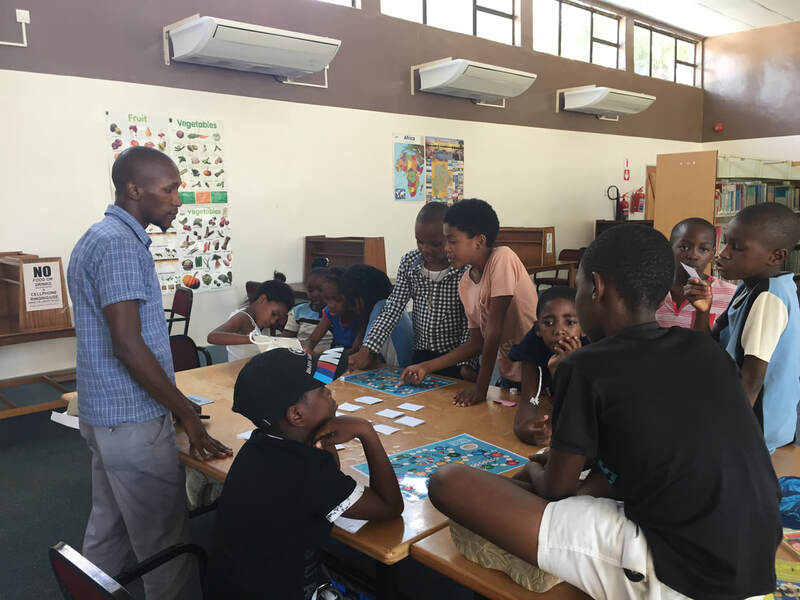 Public schools are now on break until the new term starts on April 24, so the turnout was light at this Friday's Banabakgwale Association after school SDGs seminar for kids at the Gaborone Public Library. 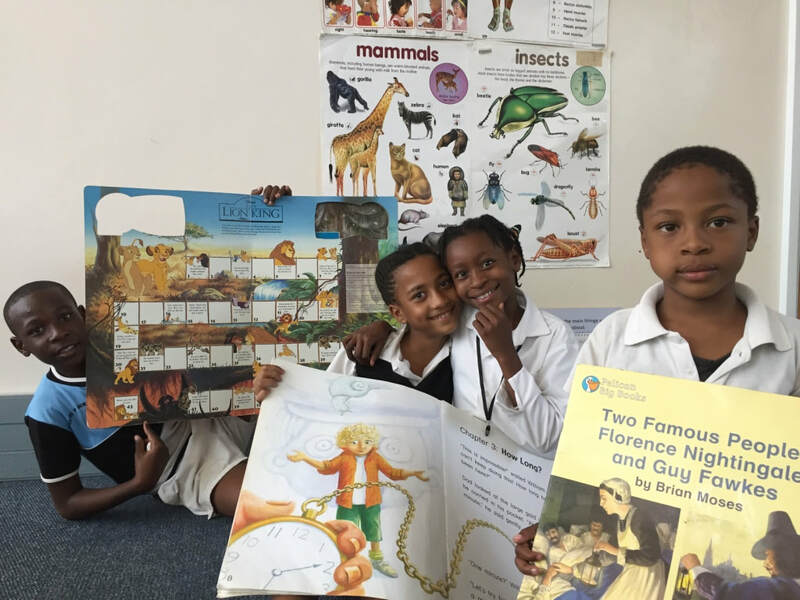 The kids practiced reading out loud using an online story book called Frieda written by the United Nations Information Centre in Namibia. Banabakgwale is planning several events for Global Youth Service Day April 12-14 that I hope to assist with. We will pick up our project with Nare Sereto Junior Secondary School in Gabane after the break. 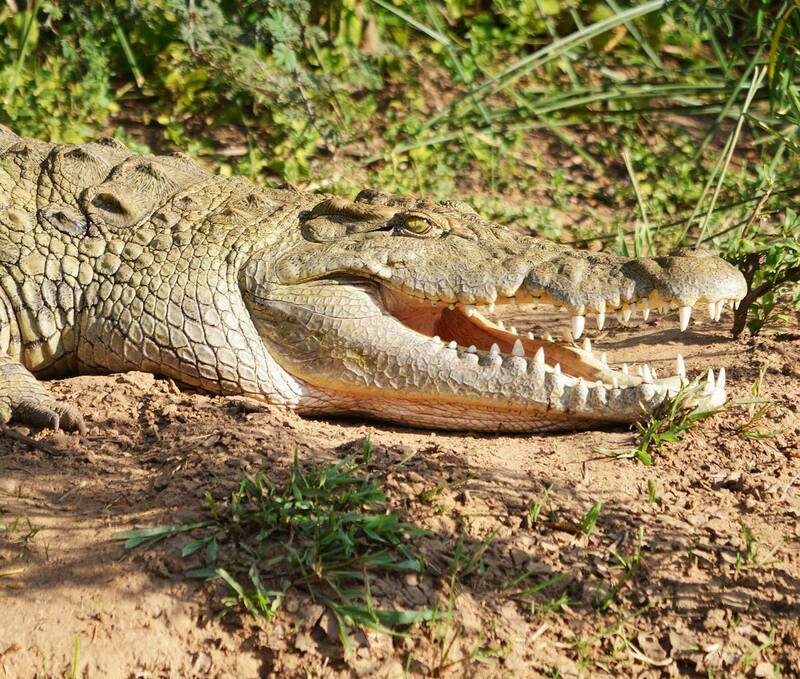 On Saturday I joined English Language Fellow Susan for the Crocodile Pools River Safari just outside of Gabs on the Notwane River. Beautiful, peaceful, and lots of birds, monkeys and three crocodiles spotted! 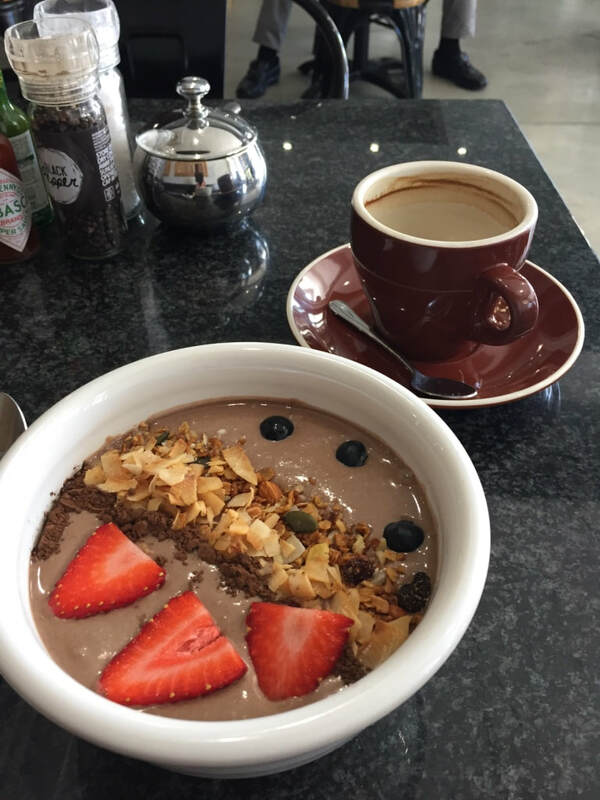 Week 9: "It Means Growth"
Life in Gabs now has a sort of predictable routine. 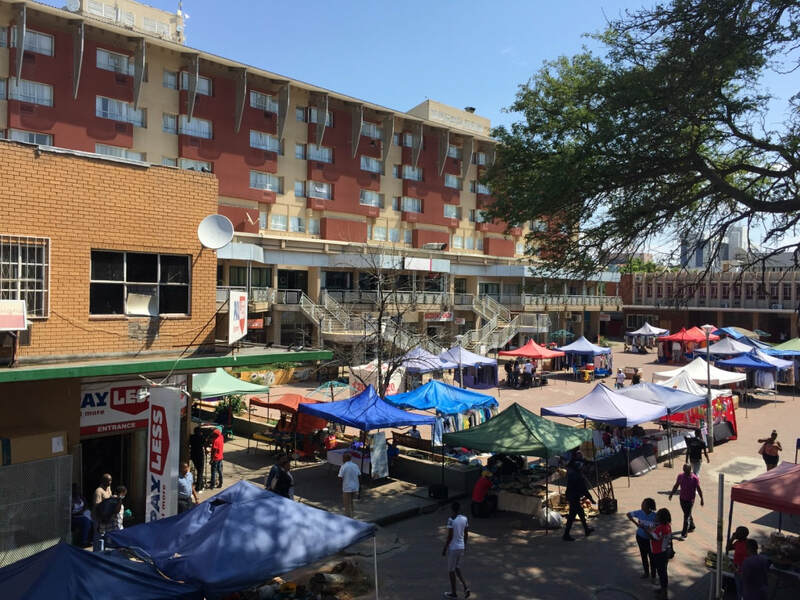 On Mondays, Wednesdays and Fridays I have my Demography of Botswana class at UB from 10:50 to 11:50 a.m. and during those afternoons and on Tuesdays and Thursdays I get some computer work done in my office and try to make appointments to interview people. Public schools have been taking exams since March 14 and will be on break from April 5 to April 23, so no school visits again until late April. 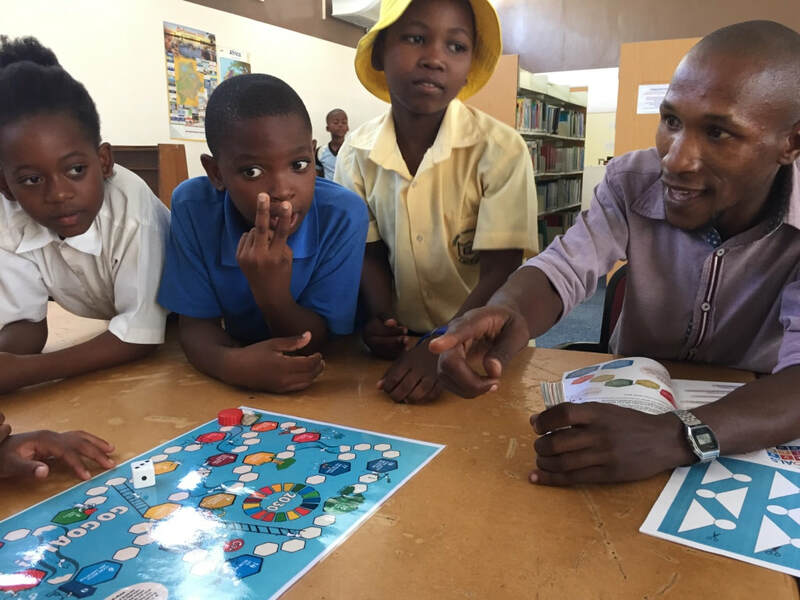 Friday afternoons I am typically at the Gaborone Public Library with Banabakgwale Association for the SDGs seminar for kids. Connecting with people to interview can be either surprisingly easy or amazingly difficult. I've taken to using Facebook to identify potential organizations and people, send a Facebook message and then if I'm lucky this leads to an exchange of WhatsApp numbers and/or local phone numbers and the communication progresses from there. A few professors at UB have been helpful, especially Dr. Kubanji, but for the most part I am left to my own devices. Once I connect with someone, say from a NGO, I ask for contact info for others that they recommend. E-mail is the least effective method of communication. 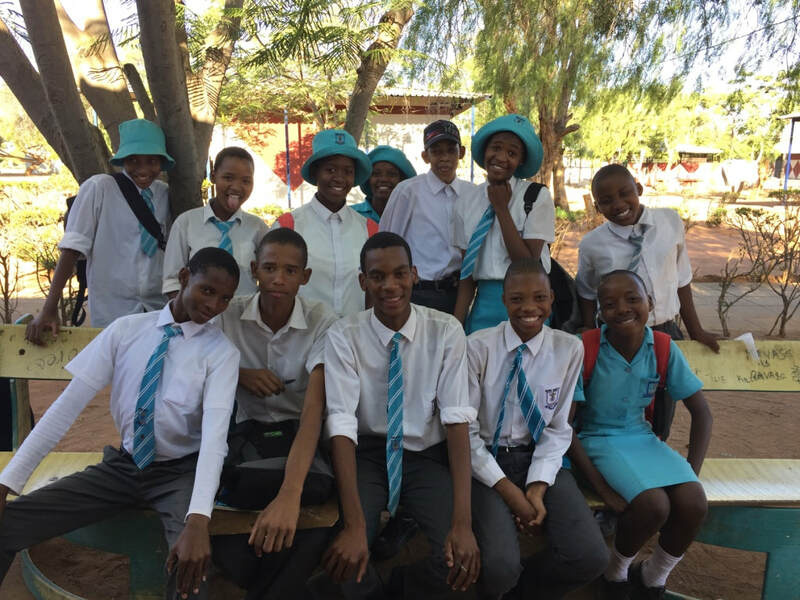 A portion of my Inquiry Project focuses on better understanding efforts on the part of government, education and NGOs in Botswana to empower youth to contribute to sustainable development. The most interesting efforts are coming from the youth themselves, in particular those that have chosen to form NGOs and businesses to help fellow youth develop soft skills that are not generated by the educational system itself. This week I met with Laone of Young Minds Association. 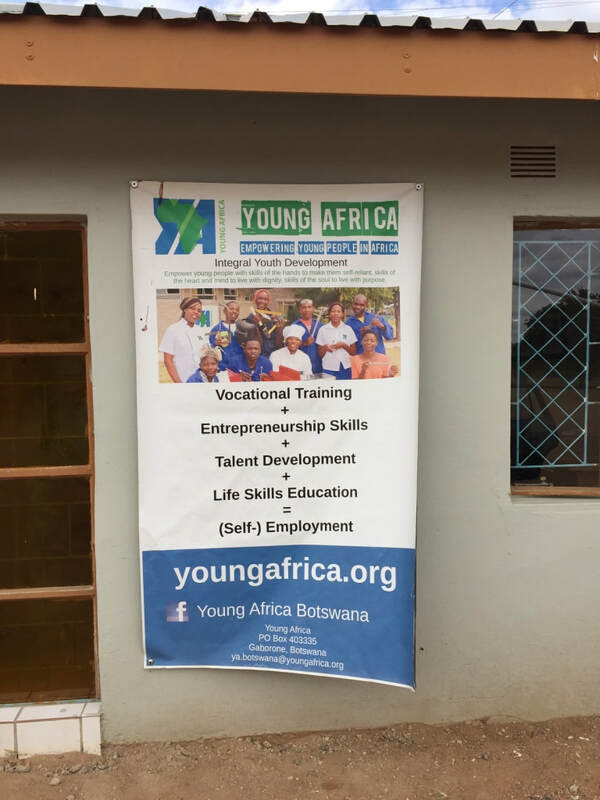 Young Minds is an NGO that focuses on youth unemployment using entrepreneurship as a tool and utilizes a three-step process: motivate, train and mentor. 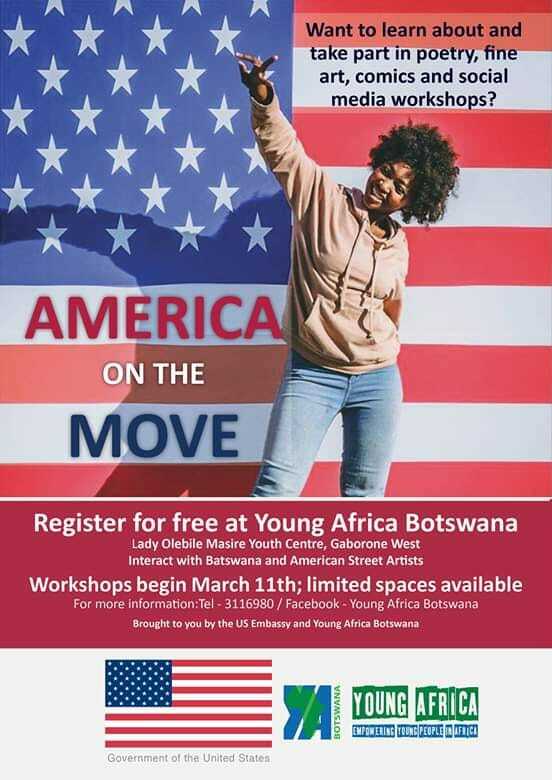 Young Minds will be offering trainings this week on the UB campus as part of an Entrepreneurship Week and also secured a contract with the U.S. Embassy to provide an upcoming 6-week entrepreneurship training for 50 youth. Laone explained to me the "blame game" surrounding youth unemployment, which now sits officially at 36%, but is in reality thought to be much higher. Botswana's employers say youth lack skills. 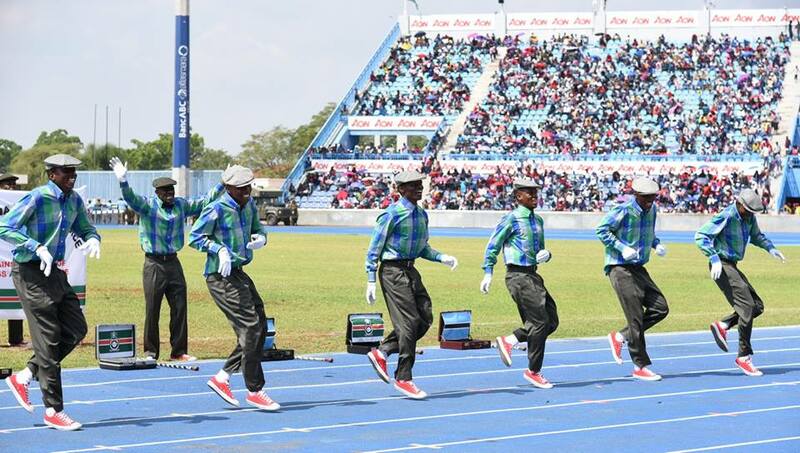 Botswana's government and some members of the general public say youth are lazy and unwilling to take entry level jobs. The youth and their advocates say it is nearly impossible to be hired, even with a university degree. When youth organized a nonviolent unemployment protest in front of Parliament in 2016, they were beaten and jailed. 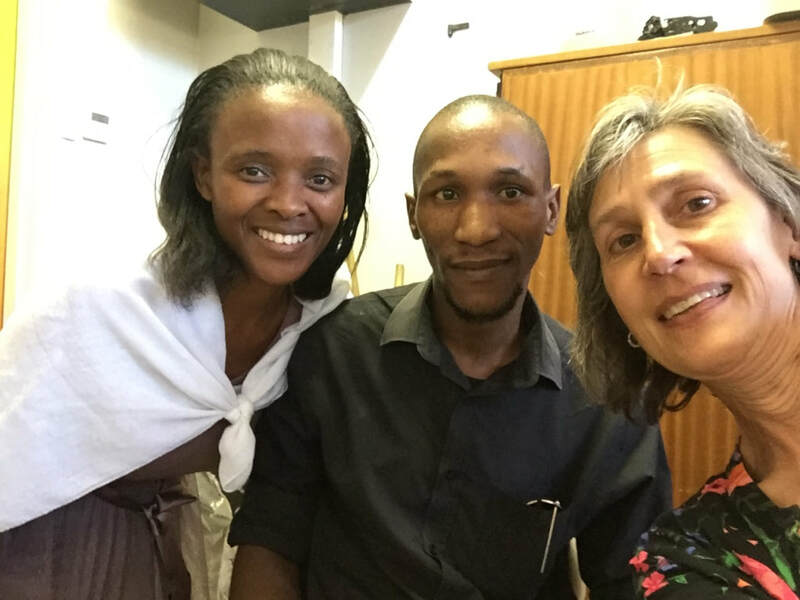 A follow-up meeting this week with Sammy and Rati of The Botswana Youth Empowerment Projects offered further support for these ideas. 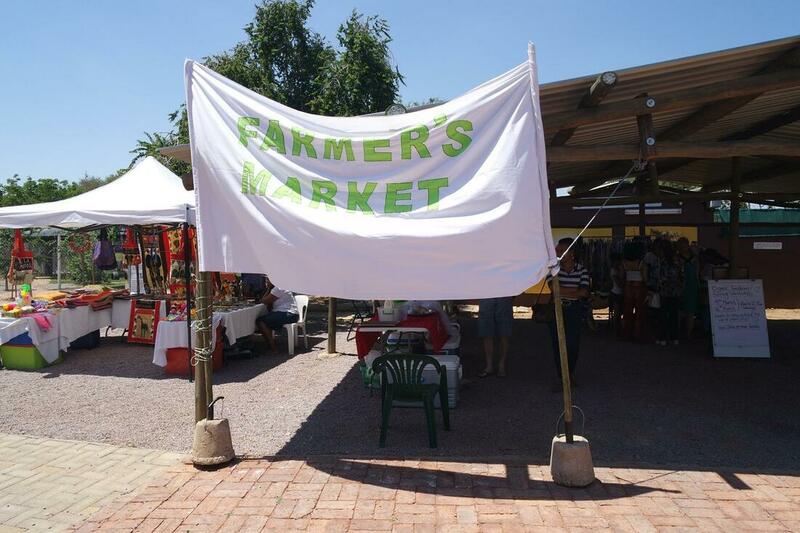 ​Listen to their contribution to a BBC radio story about youth unemployment in Botswana. On Thursday I attended a Human Trafficking in Botswana Youth Conference organized by a group of 2018 Mandela Washington Fellows at the UB Conference Center. More than 200 youth attended the conference which included presentations by a survivor of human trafficking, representatives of the International Organisation for Migration, the Botswana Ministry of Defense, Justice & Security, the Botswana Department of Social Protection, the Gaborone City Council Mayor, the Deputy Chief of Mission for the U.S. Embassy Kali Jones, and brief comments by the new U.S. Ambassador to Botswana, Craig Cloud. The survivor of human trafficking spoke in Setswana, so I was not able to understand her story, but it was obvious from the reaction of the audience that it was riveting. The Q & A segments were thought-provoking and it was inspiring to see a room full of youth engaged and motivated to take action. 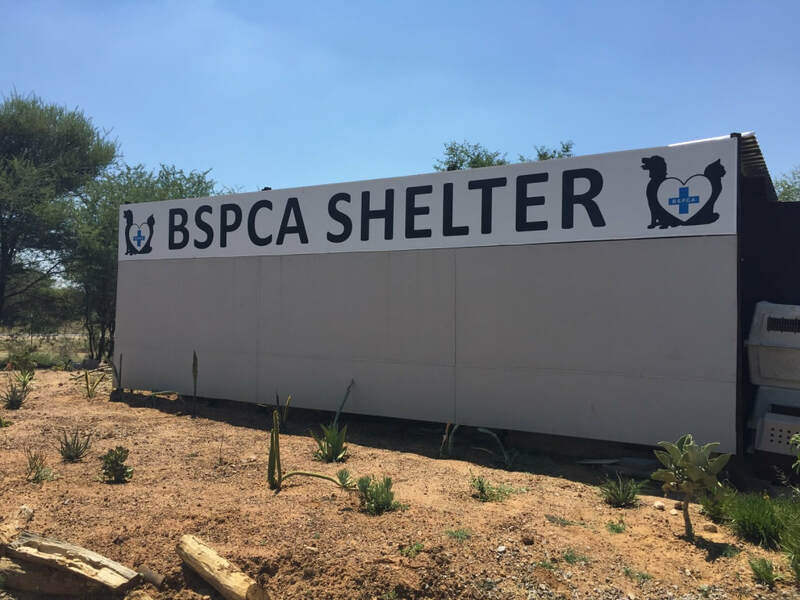 On a global scale, Botswana is not a major destination or transit country for human trafficking, but trafficking is an issue of concern and HIV/AIDS orphans and unemployed youth in particular may be targets. The government of Botswana is currently assisting 31 identified victims of human trafficking. I journeyed to Gabone by combi once again with Tebatso and Motheo of Banabakgwale Association to visit the Head of School at Nare Sereto Junior Secondary School. When I visited the school last week we met with the Deputy School Head, but protocol requires that we meet with the actual Head of School before proceeding with our project. 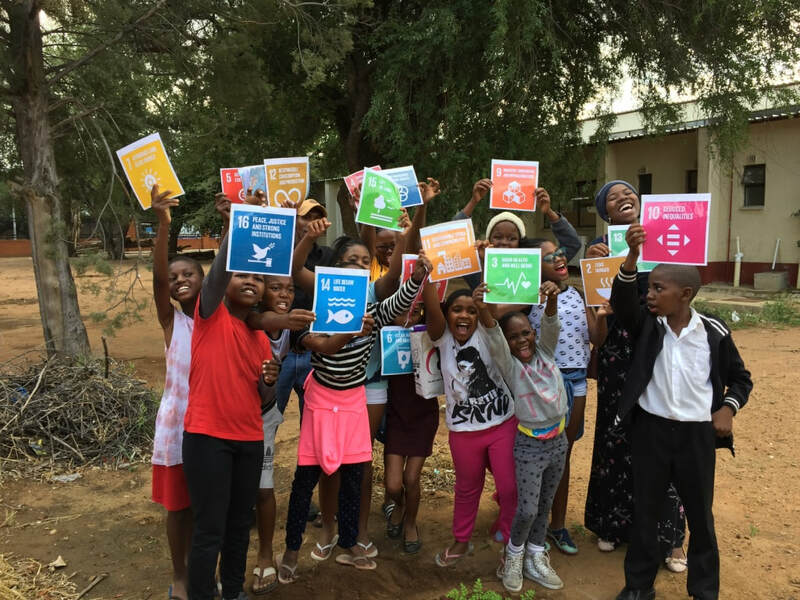 I am piggy backing on the work that Tebatso is doing with the after school ICT Club, hoping to survey those students and to engage them in a future SDGs-related Flipgrid dialogue with Stillwater students. Plans move slowly. 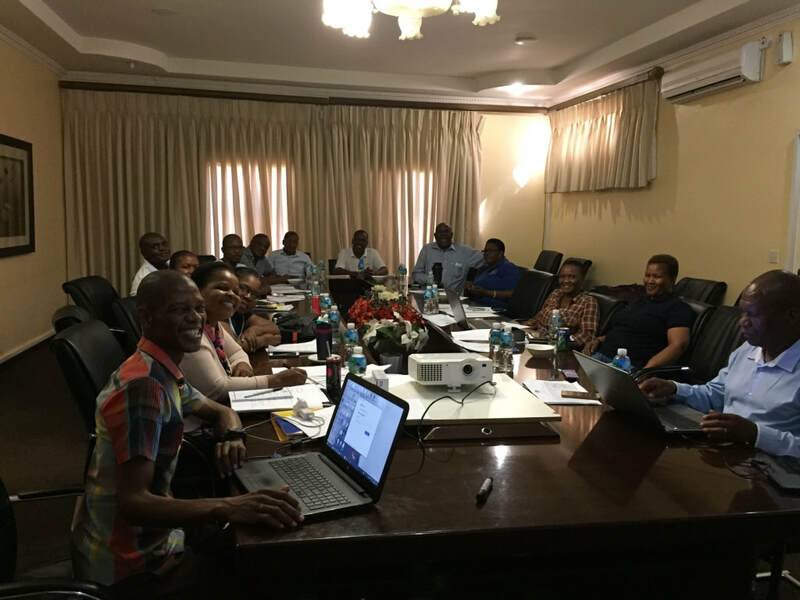 A wrinkle in these plans is that Tebatso was notified late Thursday that he has been accepted into the Young African Leadership Initiative (YALI) Regional Leadership Center Cohort 17. I am so happy for him and all of the doors that this will open for him and as an American, proud of the Obama administration for launching this program that continues to positively impact many young leaders that I am meeting in Botswana. (As an alumnus of the U.S. Department of State Teachers for Global Classrooms program I scored 40 applications for this program back in 2014, which was fascinating.) When I asked what this opportunity means to him, Tebatso replied “It means growth”, with a big smile on his face. 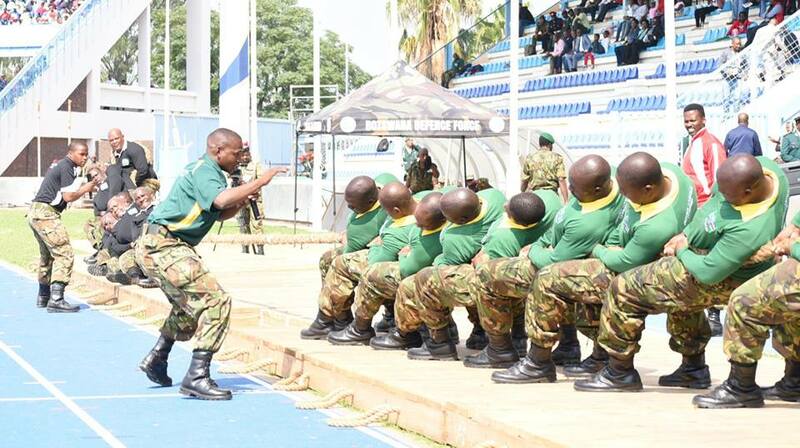 This does mean, however, that he will need to be in South Africa for the training from May 6th to May 23rd. So, we shall see how our plans at Nare Sereto progress. The cow got up right after Tess snapped this picture and we both went running! 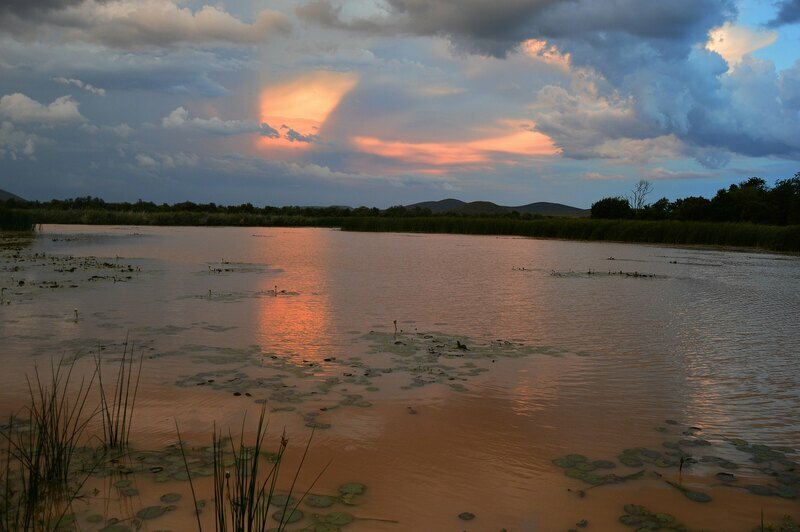 Botswana's never ending summer continues, with hot sun, little rain and temps in the 90's. Batswana are constantly talking about the hot, dry weather and the impacts of climate change they are experiencing now. Botswana is an arid country with an agricultural sector dependent on cattle grazing and sorghum and maize crops. 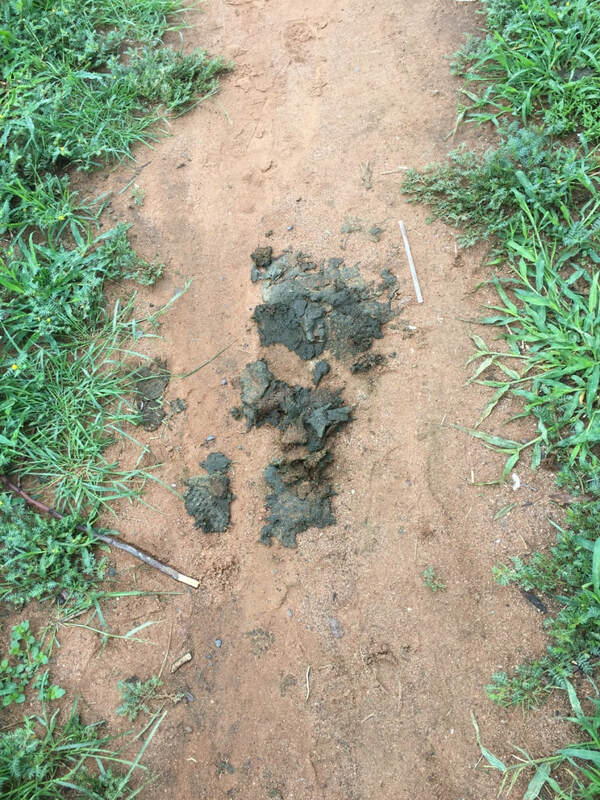 Cattle can't find enough grass to eat and farmers can't plant crops in dust. Meanwhile, neighboring Mozambique, Malawi and Zimbabwe are reeling from the storm surge and flooding wrought by Cyclone Idai. 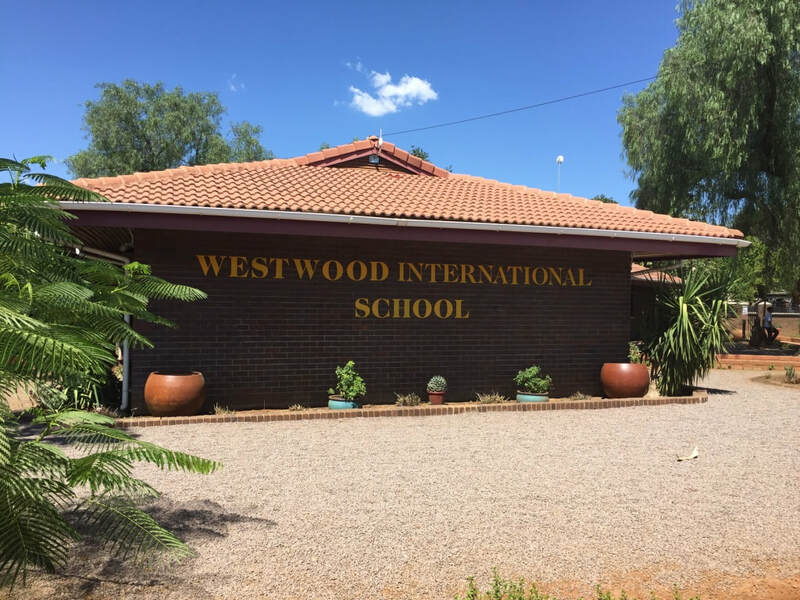 This week I visited a private school, Westwood International. Westwood is an International Baccalaureate (IB) school that includes both primary and secondary grades. 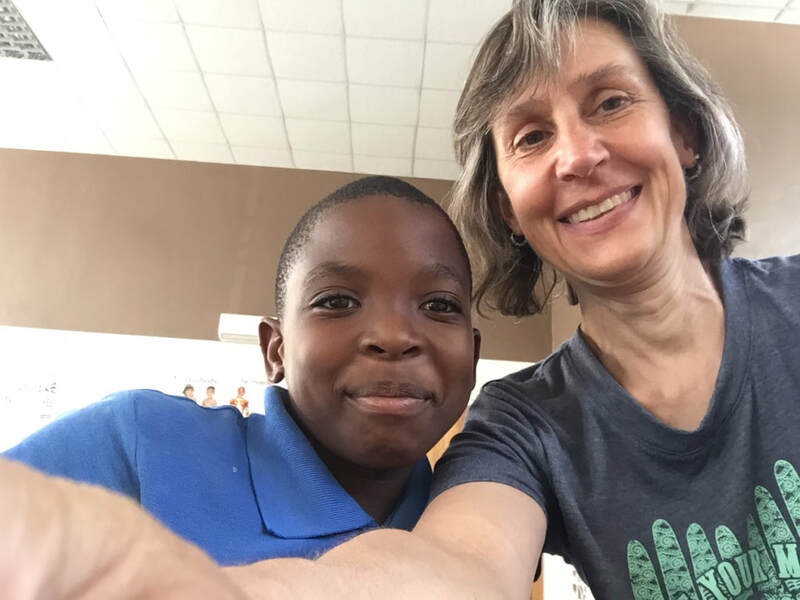 I was welcomed by the Secondary Principal and spent time in four Geography classes, two with high school aged students and two with middle school aged students. Lesson topics included economic flows, extreme environments, map reading and biomes. Westwood is similar in many ways to Maru-a-pula that I visited last week. 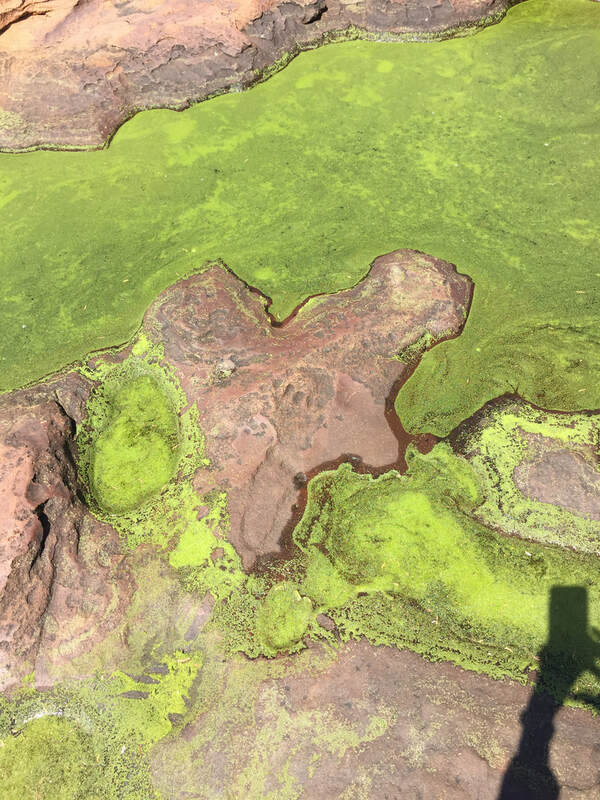 The high school level Geography teacher supplements her curriculum with some of the same online resources that we use in Stillwater. On Thursday I interviewed Andrea Malenya of the Botswana Book Project, which is affiliated with Books for Africa. 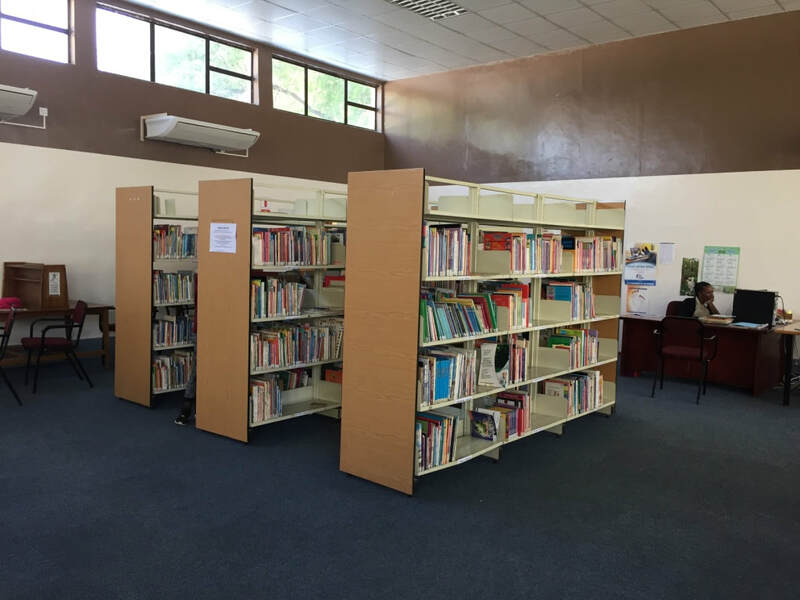 We talked about the possibility of the Gaborone Public Library tapping into their book donation system as the children's library only has four shelving units of books, most of which are old and Eurocentric. I shared her business card with the librarians and they plan on arranging a meeting. I also headed outside of Gabs to Gabane to visit Nare Sereto Junior Secondary School with Tebatso of Banabakgwale Association. 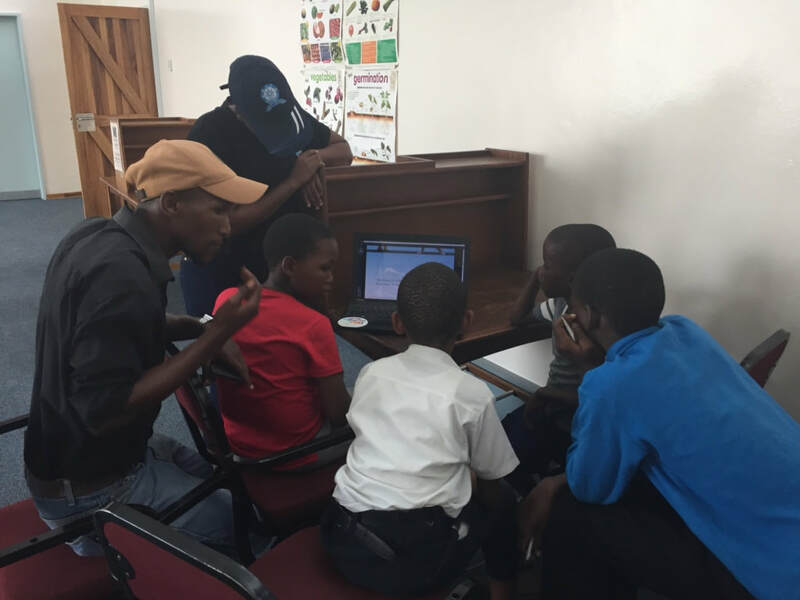 They have "adopted" the school and help with an ICT Club after school on Tuesdays and Thursdays. 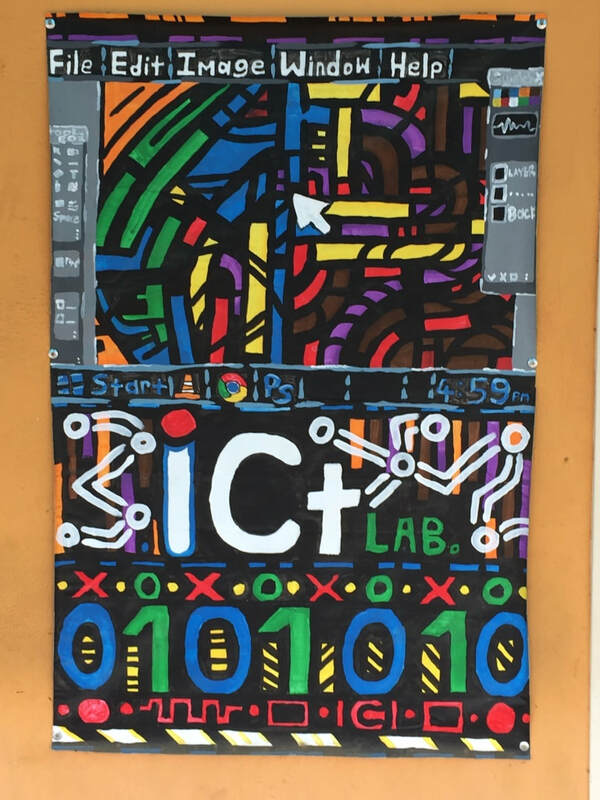 We met with the ICT teacher Gloria and the ICT Club and discussed plans for me to possibly conduct a survey with the learners and help organize a virtual exchange with Stillwater as part of their World ICT Day event in May. Interestingly, their computer lab currently has NO COMPUTERS in it as it is being used as a teacher work room during renovations. Friday included a sort of scavenger hunt around Gabs to find the correct offices of the Department of Immigration and Citizen Services to either procure a residence permit waiver, a residence permit or an extension of my tourist visa. I was able to get my tourist visa extended by 30 days but will need to return in a few weeks with more letters and documents in hand to secure permission for my remaining time in country. Sign at the entrance to Naledi Senior Secondary School. This week I was welcomed to three schools by kind administrators and teachers. I spent a day each in two public schools, Gaborone Senior Secondary and Naledi Senior Secondary. As Senior Secondary schools, they offer Form 4 and Form 5, equivalent in the U.S. system to grades 11 and 12. Social Science courses are not required, but students can choose to take History, Social Studies, Geography and/or Development Studies. 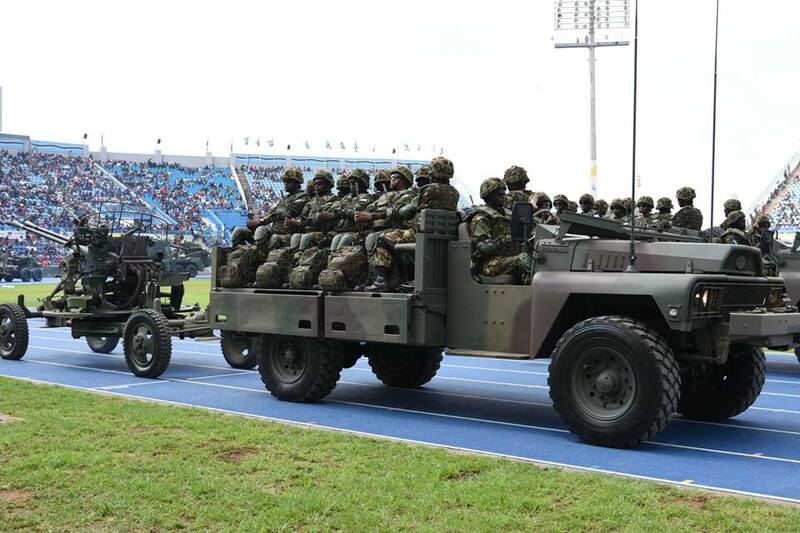 There is a fair amount of overlap in the Social Studies, Geography and Development Studies syllabi and I was told it is unusual for a student to take more than one of these two-year courses while at Senior Secondary. 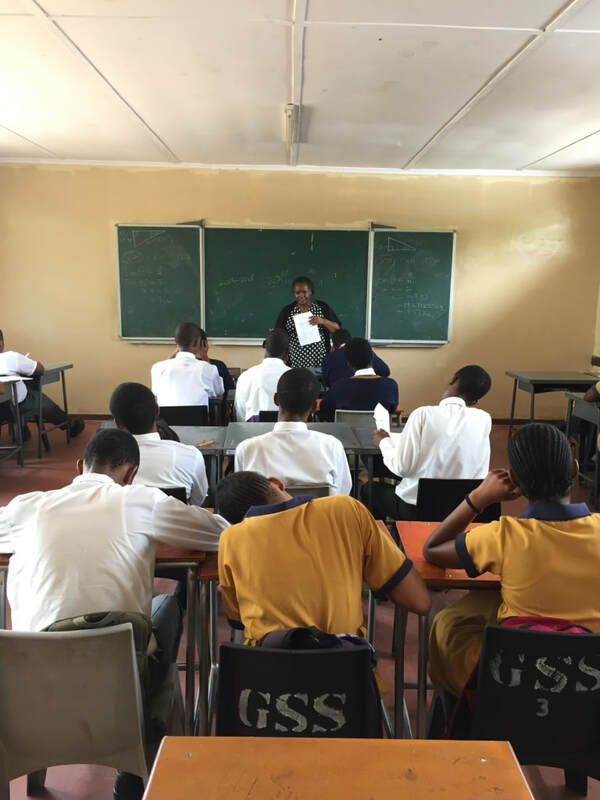 I have had the opportunity to visit lots of secondary schools on the African continent over the past eight years, including schools in Ghana, Namibia, Kenya and now Botswana. 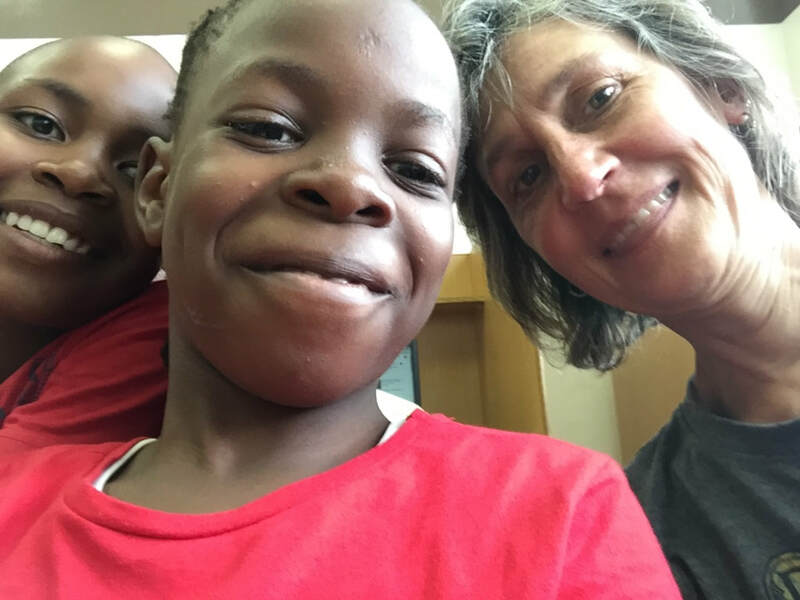 The continent is huge and diverse, but there is a similarity in what I have seen in public schools in all four countries, certainly related to the European colonial and missionary legacy. School starts and dismisses relatively early in the day to beat the heat. Classrooms are simple, crowded with well-worn tables and chairs, a chalkboard, lots of ambient noise and maybe ceiling fans. Instructional resources are scarce and dated, instruction is in the second (or third or fourth) language of English (Botswana's native languages include Tswana, Kalanga, Kgalagadi, Shona, Tshwa, Mbukushu, Ndebele, !Xoo and more ...) and teachers for the most part teach to the national exams using the lecture method, while uniformed students dutifully make notes in tidy handwriting. There is a severity in the manner of some teachers that I believe discourages student risk-taking and participation, along with the threat of physical punishment by stick, which some teachers carry with them at all times. There is no data privacy regarding marks. Teachers return exams to learners in front of the entire class, praising and chastising as they work their way through the pile from the highest score to the lowest. Teaching is a physically and mentally challenging profession under the best of conditions. 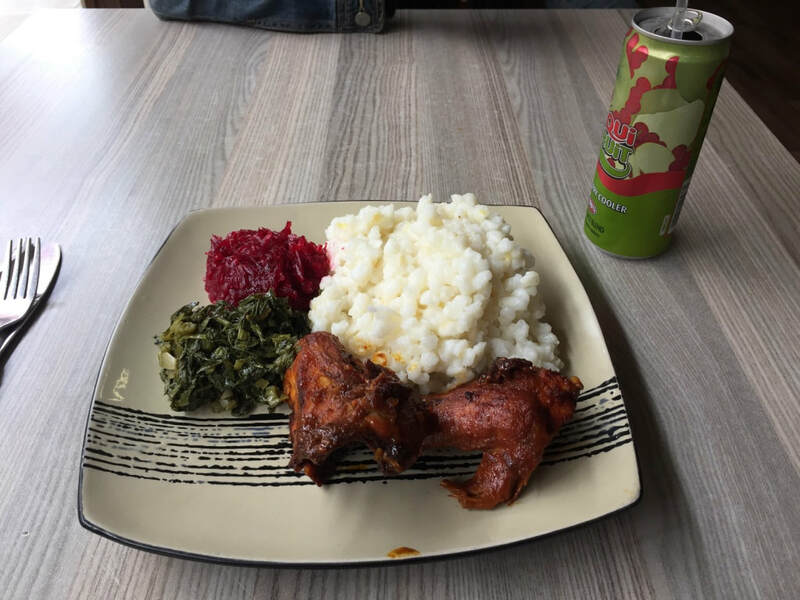 In Botswana public school teacher pay is low, expected overtime is high, resources are scanty, facilities are often dilapidated and opportunities for advancement are limited. It is easy to discern when a teacher has cultivated a more encouraging, active learning environment. The national syllabi content itself is engaging and I was able to listen in on discussions of global challenges, international organizations and gender disparities resulting from cultural practices. I enjoy learning how curriculum is situated in a Southern African and Botswana context. For example, on the list of global challenges learners were considering were HIV/AIDS, desertification, and corruption. A lesson on map reading used a topographic map of Zimbabwe. Student presentations on international organizations included SADC (the Southern African Development Community). 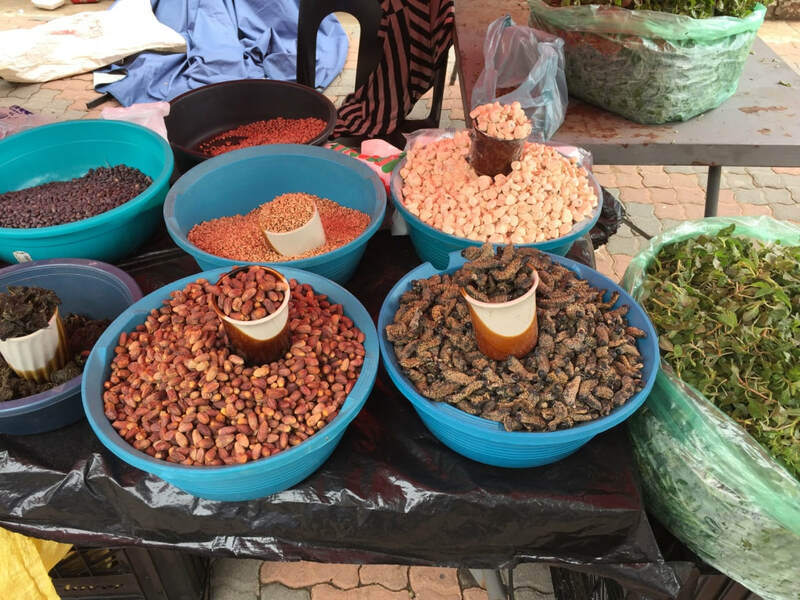 Traditional Tswana cultural practices debated included bogadi (bride price), seantlo (practice whereby a widow marries her husband's younger brother) and the rarity of female chieftainship. 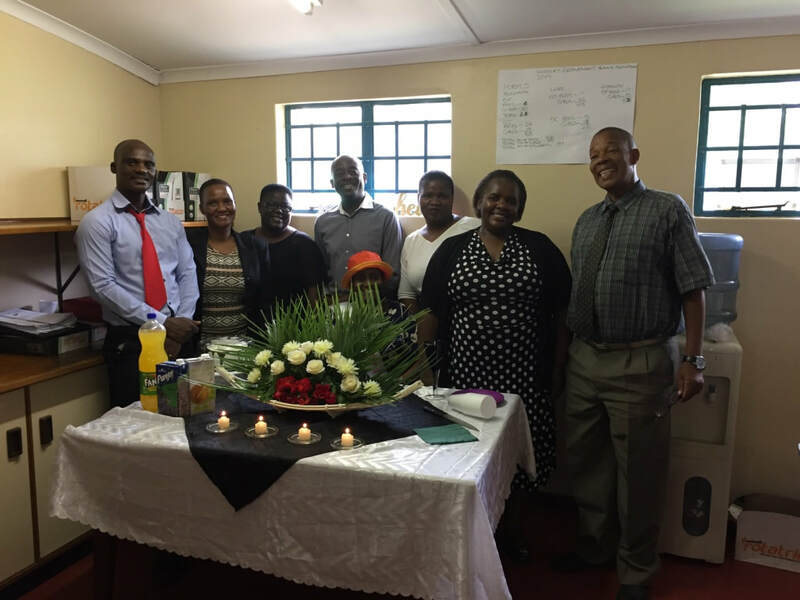 The culminating activity in the Development Studies course at Naledi is project-based. After conducting a broad needs assessment of the school in teams, students propose hands-on improvement projects, solicit community bids, vote to narrow options, raise funds by selling snacks at school and implement the project. Past projects provided air conditioning for teacher offices, floor tile, whiteboards, computers and more. The class I visited had narrowed down their options to a LCD projector for the school assembly hall, a welcome board for the main entrance of the school and upholstered stools for a student common area. In addition to the two public schools, I also visited Maru-a-pula, considered one of Botswana's best private schools. 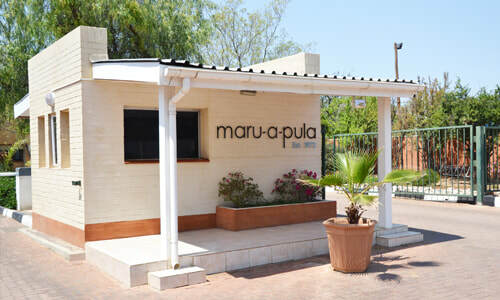 Maru-a-pula prepares students in Forms 1-6 (equivalent in the U.S. system to grades 8 through 13) to take both the Cambridge International General Certificate of Education O-level and A-level exams. These exams are internationally accepted gateway exams to post-secondary education. 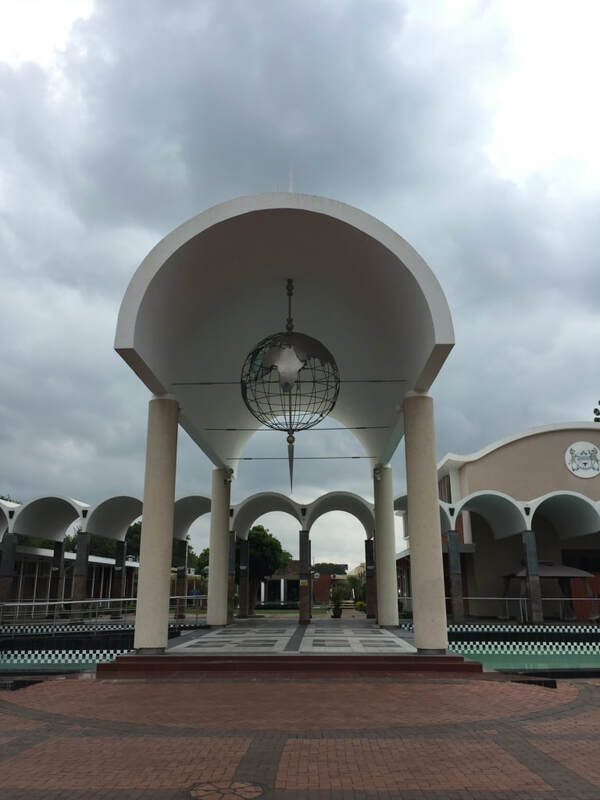 The campus is leafy and pleasant with a relaxed classroom atmosphere and an emphasis on co-curricular service, physical education and arts activities. Students (68% Batswana, 32% international) are allowed to have mobile phones in class (not allowed in public schools) and the dress code is more relaxed. No uniform per se, but some sort of black bottom and white top. I was hosted by three members of the Geography Department (including a very generous-with-his-time Princeton in Africa Fellow) and observed three Geography and one Business class. In contrast to the public schools I visited, all teachers have laptops and classrooms have LCD projectors and air conditioning. The most interesting part of the day was a Q & A session with a class of Form 6 students. 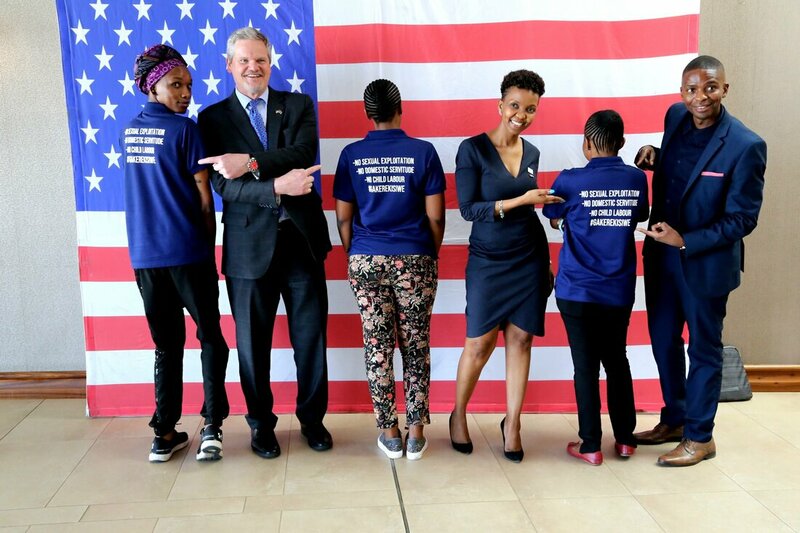 Several are hoping to attend university in the U.S. and had thoughtful questions about differences between the Botswana and U.S educational systems. This week I also met with Samuel from the Botswana Youth Empowerment Projects and look forward to more communication with this NGO in the future. On Friday I was back at the library with Banabakgwale Association for the weekly SDGs seminar for kids . 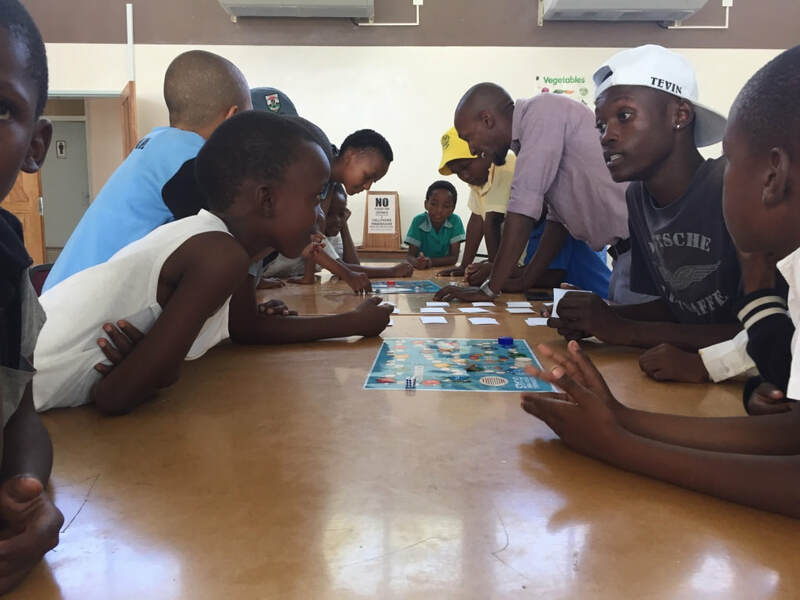 Tebatso and Tevin brought the SDGs Board Game and we had fun playing the game with the kids, all while helping them practice and comprehend English as they read and responded to questions. No sweets this week, but fortunately I had a couple of inflatable globes in my backpack that we used for prizes! In the sunshine and heat of Botswana, it is common to see people, especially women, walking with colorful umbrellas to block some of the sun's rays. This week I came out from under an umbrella because I finally have the magic research permit and am free to request visits to schools and interview people to my heart's content. Senior Secondary School (not required) - Forms 4 and 5 (Grades 11-12 in the U.S. system). 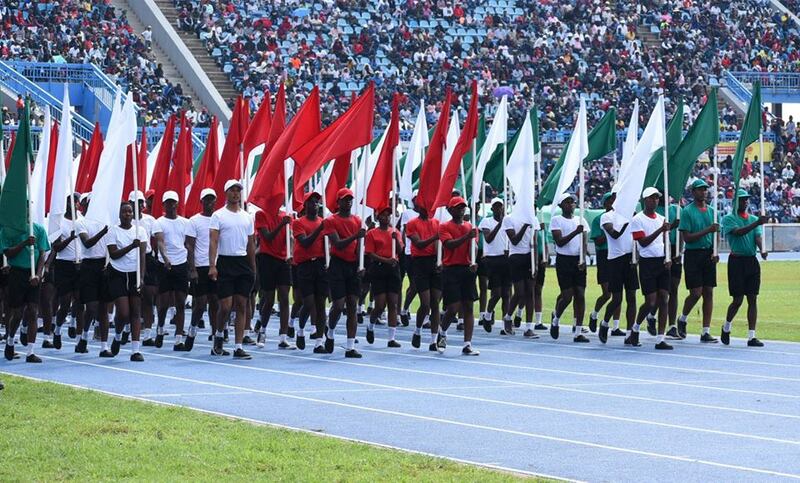 Moving on to Senior Secondary School is contingent upon desire, funds and exam scores. 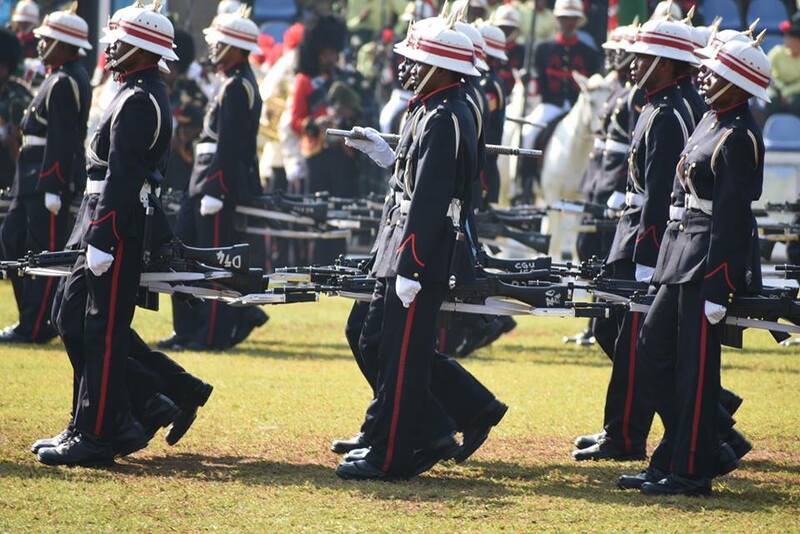 In terms of the Social Studies curriculum, in Lower Primary students have Cultural Studies, in Upper Primary and Junior Secondary students have Social Studies and in Senior Secondary students can choose from among History, Social Studies, Geography and Development Studies. I'll be visiting several Senior Secondary schools in the upcoming weeks to observe the teaching of Social Studies, Geography and Development Studies. Visiting schools requires the research permit plus a letter of permission from the Ministry of Basic Education. This was procured on Thursday by walking 40 minutes to an office building on Main Mall and waiting in a very hot and stuffy hallway for an hour until a nice man perused my newly minted research permit and all of its accompanying forms and typed a letter for me on his laptop. The expected protocol is that you just show up at the school with the letter. 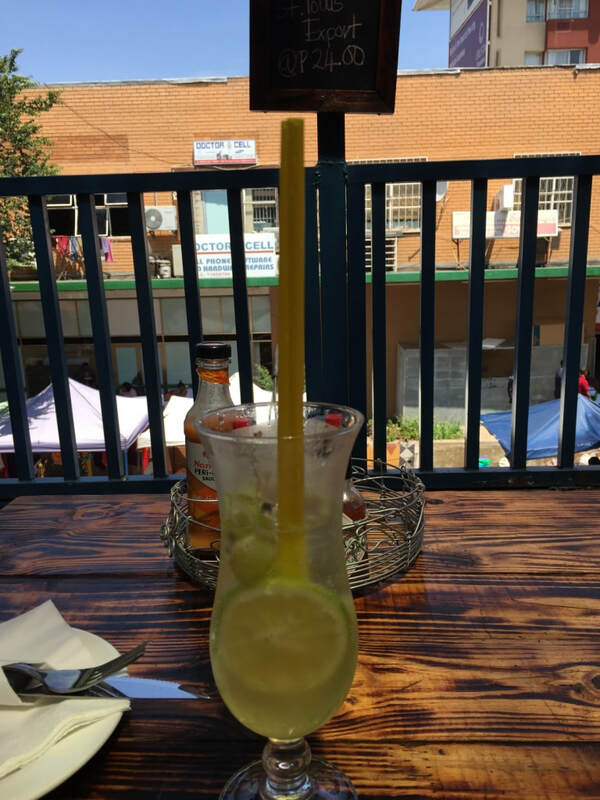 Fortunately I have contact info for the teachers I met at the Social Studies meeting last week so I have connected with two of them to make arrangements for the coming week. UB will be on spring break, so no classes, and I can use the time to visit schools. Evening of music and conversation with Roxie Hentz, former Fulbright DAT in South Africa here for one week to lay the groundwork for a trip for youth she is leading in August. 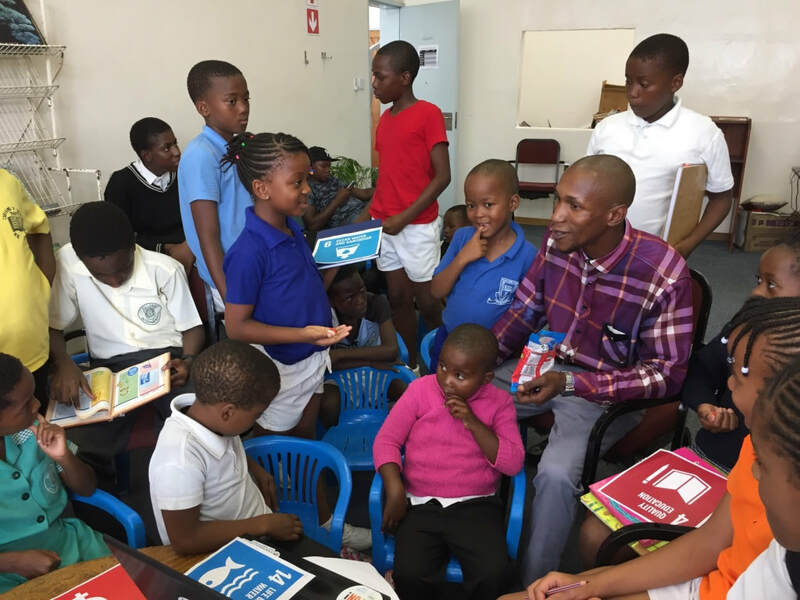 On Friday afternoon I once again returned to the Gaborone Public Library for the SDGs seminar for kids sponsored by Banabakgwale Association. 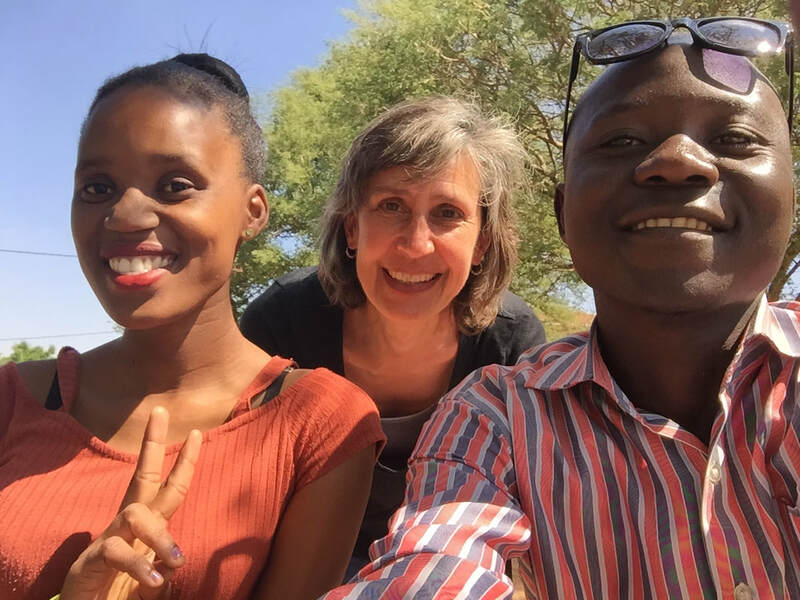 No seminar this week as Tebatso had some other pressing matters to work on, but I was able to meet his Banabakgwale partner Motheo and talk more about potentially connecting Batswana youth with U.S. youth to dialogue about sustainable development topics. They are planning a World ICT Day event in May at a Junior Secondary School in Tebatso's home village of Gabane and invited me to be a part of that event. Tebatso also formally introduced me to the Senior Librarian. I showed her the magic research permit, her demeanor flipped 180 degrees from skeptical to helpful and before you know it I was on the phone with her contact Samuel from the Botswana Youth Empowerment Projects setting up a phone conference next week. 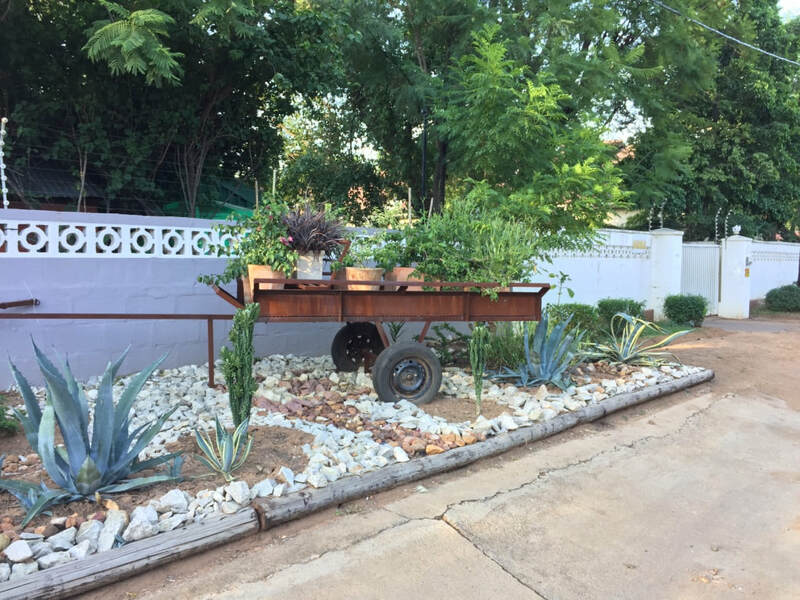 She and I also talked with Tebatso about a grant he is applying for to create an outdoor space for kids at the library and the possibility of connecting with the Botswana Book Project to add some new children's books on Sustainable Development Goal related topics. Lots of brainstorming at this point, so we shall see which plans come to fruition! 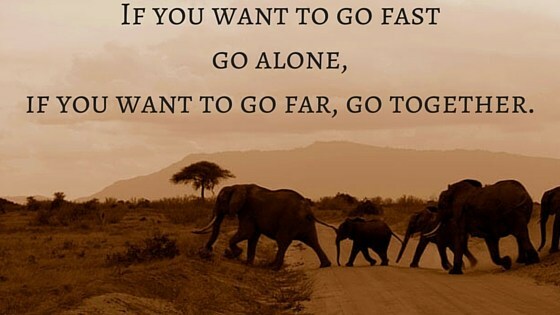 Week 5: Alone or Together? 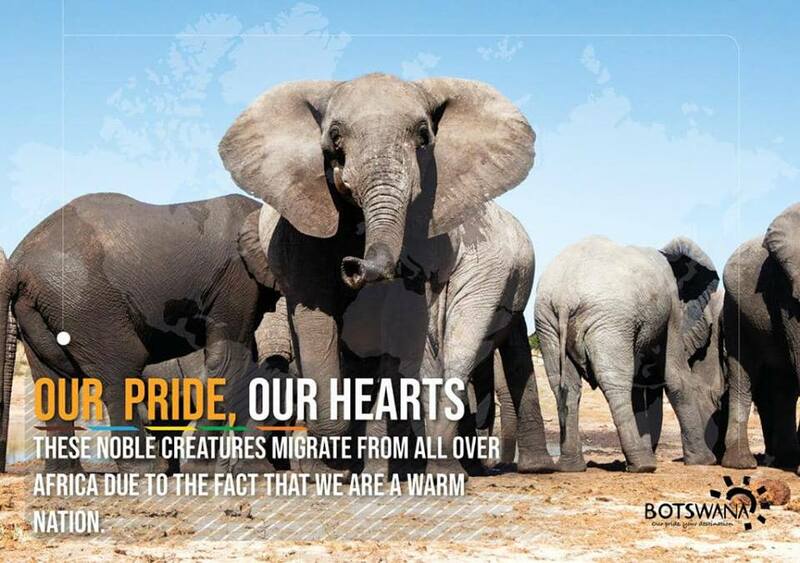 Botswana's estimated 135,000 elephants were in the news this week. This week I continued to battle information gaps, communication barriers and bureaucracy to obtain the elusive research permit that will allow me permission not only to visit public schools and survey students (as I thought until this week), but is actually required for me to legally talk to anyone in a substantive manner about my Inquiry Project (big oops). Thank you to Fulbright support staff Leah, Vachel and Naomi for stepping in and trying to move things forward. It's been a lonely slog and a little shoring up was needed. Keeping my fingers crossed that I will have the permit early this week. Rebecca Kubanji of the Population Studies Department arranged for and accompanied me to a meeting at the Botswana Ministry of Finance and Development Planning. We met with three representatives of the Population and Development Coordination Section. This section is responsible for helping to create and disseminate public information about both the demographic dividend and the Sustainable Development Goals. Our conversation included several key topics: high youth unemployment, HIV/AIDS, regional disparities in fertility rates, continuing high maternal mortality rates despite good health care access and human-wildlife conflict. The major news story of the week was a call for discussion of lifting a 2014 ban on elephant hunting. Diamond mining and safari tourism are Botswana's major sources of income and wildlife conservation has traditionally been prioritized. Some rural communities resent the loss of income from trophy hunting and have experienced crop loss, property destruction, and human deaths from elephants. Elephants are travelling further from their traditional habitat areas and closer to urban areas. 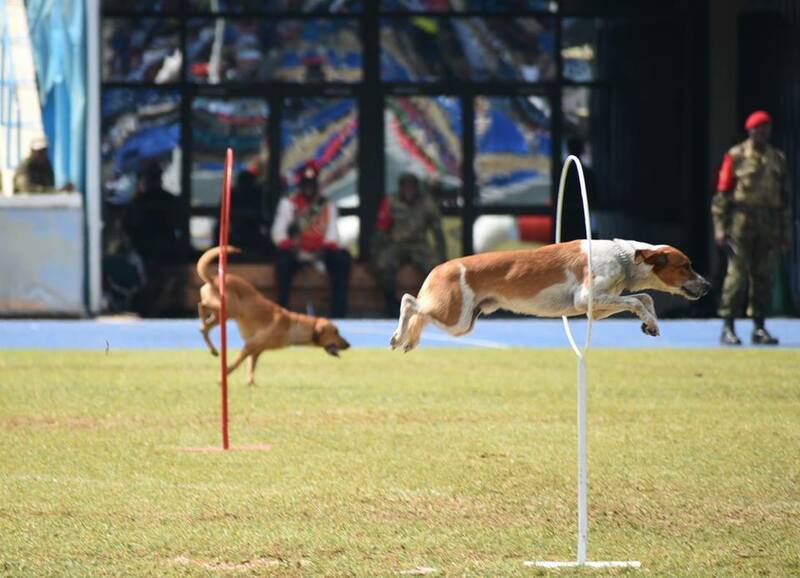 President Masisi is standing for election in October 2019 and trying to walk a fine line between all the competing interests. Fulbrighters on the UB campus (four of us, as Tess is travelling, the other three are college professors) and U.S. Embassy Fulbright staff were invited to a meeting with UB Vice Chancellor David Morris and his staff. We summarized our projects and experiences thus far at the university. The professors suggested establishing a core curriculum to shore up humanities enrollment in the face of a STEM emphasis, integrating Zoom video conferencing technology into the new online nursing program and streamlining the course registration process for students. The UB campus has capacity for 18,000 students but currently enrolls only 12,000. 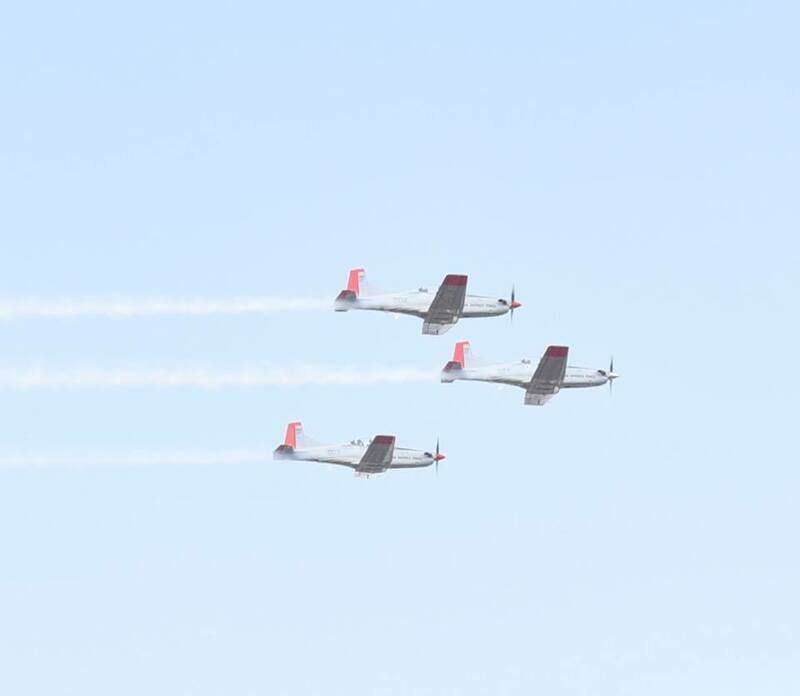 The Vice Chancellor hopes to increase enrollment, in part by attracting more foreign students and increasing online enrollment opportunities. Thursday and Friday were fun days spent at a workshop of warm, welcoming Social Studies teachers who serve on the Social Studies Standing Committee revising the national syllabus for Senior Secondary Social Studies. Their task is to transform the curriculum framework from content-based to outcome-based. I listened in and contributed what I could to large and small group discussions on Thursday and was then asked to present to the group for about 30 minutes on Friday. At the suggestion of Jobe Kefaletse, the Ministry of Education Social Studies Specialist who invited me and led the workshop, I quickly prepared a presentation on 5 Free Technology Tools for Teachers. I'll have a one-on-one meeting with Mr. Kefaletse this week to learn more about Social Studies curriculum in Botswana. 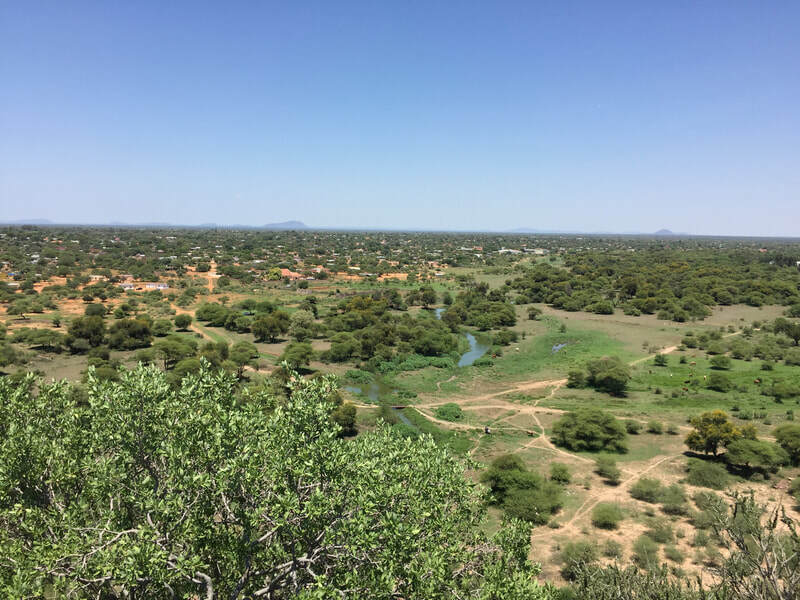 I had noticed that the college students in my Demography of Botswana class were struggling to be in the same place at the same time so they could work on a group presentation profiling the demographics of a local village. I helped a group I am shadowing get set up with Google accounts and Google Slides so they could work collaboratively from a distance. I'll be interested to see their progress tomorrow. They were off to a slow start deciding how to tackle the project and distribute the labor. For the presentation to Social Studies teachers, I included an introduction to Google Tools (Docs, Slides and Sheets) then added Quizlet, Quizizz, Padlet and Flipgrid. We played a game of Population Geography Quizlet Live as a group (they loved it) and attempted Flipgrid, but only Mr. Kefaletse was able to access Flipgrid from his laptop. Teachers had access issues not because of a lack of fast wifi at the hotel meeting site (my laptop worked great), but because the device they were using, be it a phone, tablet or laptop, was too old or slow. I have a feeling this is the same technology issue I will see when I visit public schools. Daisy, one of the Social Studies teachers at the workshop, invited me to go to church with her today. Hill View church meets at Riverwalk Mall, near my apartment, in one of the movie theaters. How do I describe the service? Born-again Christian rock and roll? Definitely a lot of togetherness. 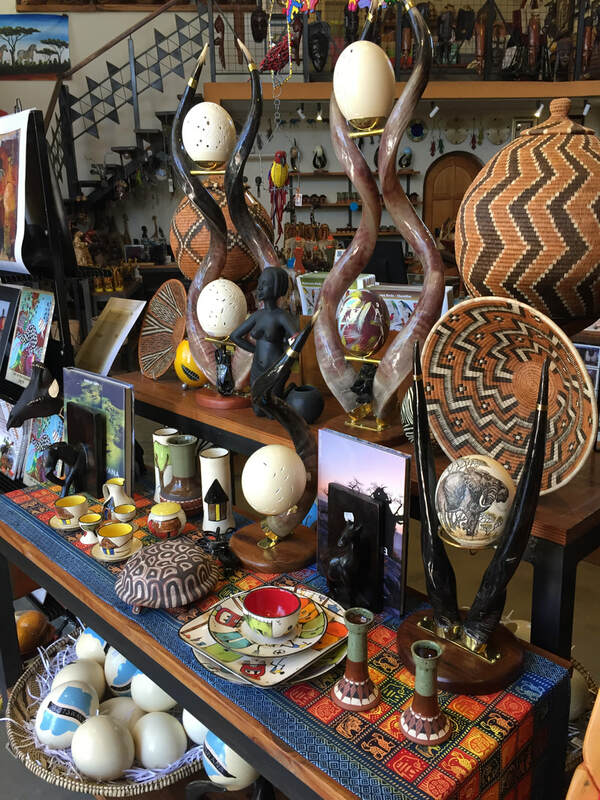 Decorated ostrich eggs at Botswanacraft. Ostrich eggs are the strongest eggs in the world. You can stand on one and it won't break. This week had some reminders of the fragility and strength of both humans and animals. Gofa, Atamalang and Agang met me to talk about their efforts as members of Green Habitat Botswana to promote environmental education and resource protection and restoration. 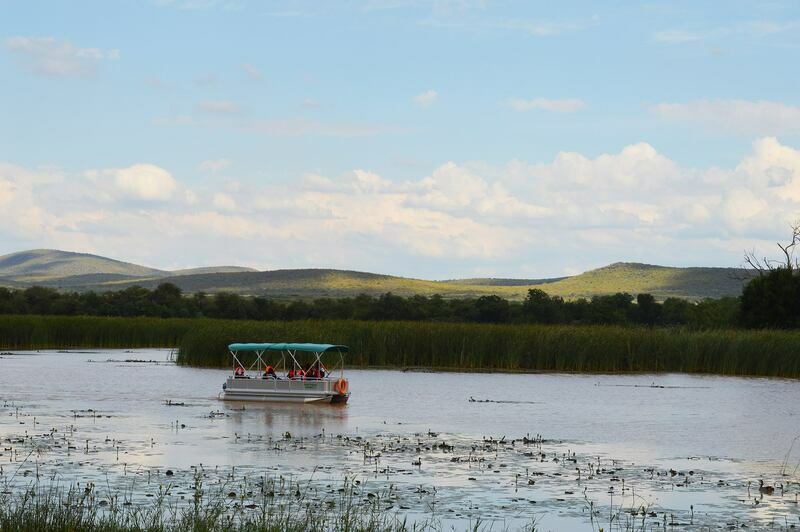 Green Habitat Botswana has about 20 active members, all young professionals, from a variety of career fields. 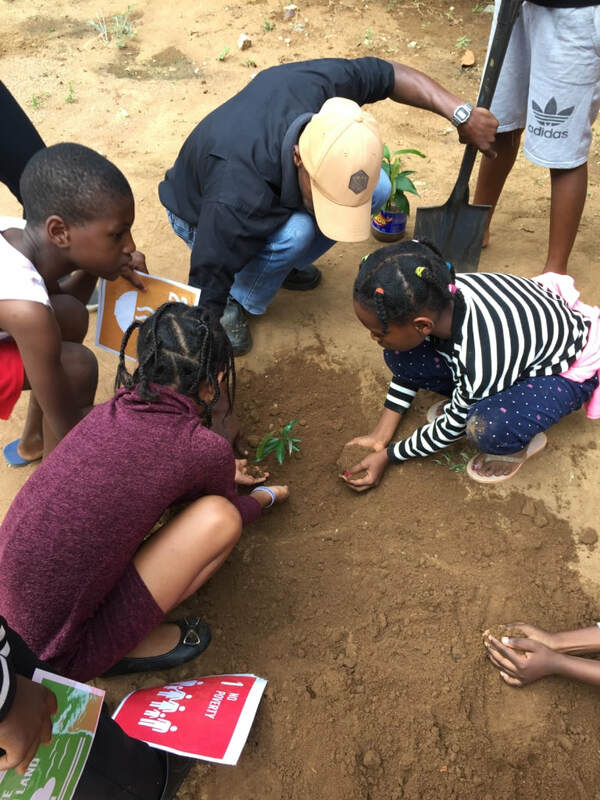 They partner with primary and secondary schools on litter picking and tree planting campaigns and share conservation info through social media. This year’s goal is to plant 3000 trees. We talked about Wangari Maathai, founder of the Green Belt Movement in Kenya and 2004 Nobel Peace Prize winner. Her autobiography, Unbowed, details her work not only to plant trees, but to work for gender equality, democracy and peace. When I first met UB Population Studies Chair Dr. Rakgoasi, he mentioned that a member of the department was very ill with cancer. 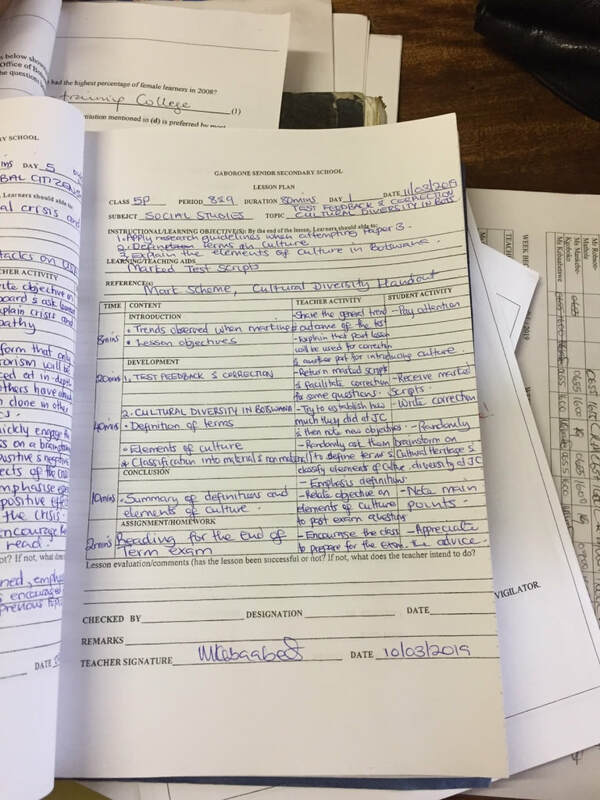 As it turns out, Dr. Bainame was a key contributor to the report that forms the foundation of my research and had previously been the instructor of the course I am auditing, Demography of Botswana. Dr. Bainame passed away this week. The love and respect that his family, colleagues and students had for him overflowed at his UB memorial service. 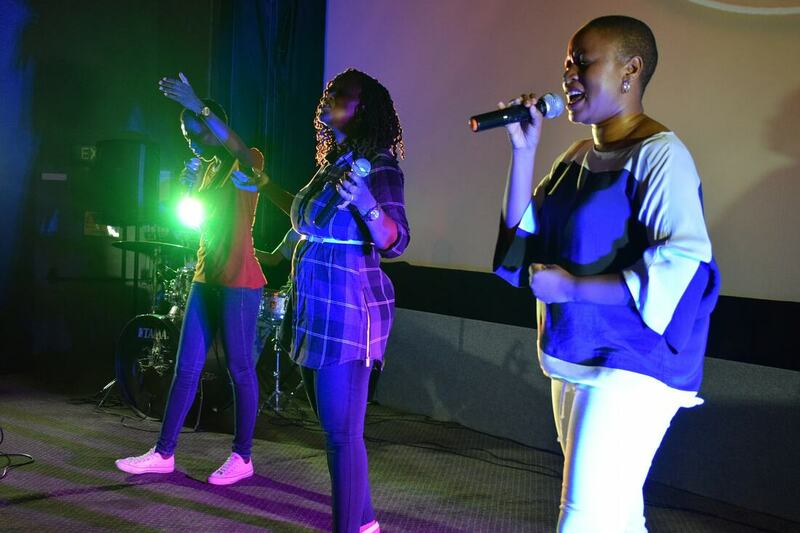 The service alternated between spontaneous hymns sung a capella in Setswana and moving testimonies. Poignant for me were the words of a PhD student, Moses, whom Dr. Bainame had mentored through his work on three degrees at the university. I first met Moses at a department meeting convened for the purpose of planning the memorial. Moses was not sure he would be capable of speaking at the service, as he was so emotionally devastated. Dr. Rakgoasi encouraged him softly, saying, “It is o.k. to cry. We are human. We cry when we are sad, and we cry when we are happy.” Somehow in the next 24 hours Moses found the strength to speak, and to speak in a way that had everyone wiping their eyes. We learned that he is South Sudanese and has endured the horrific deaths of family members and friends through years of conflict there. He said he had never cried tears over those losses. His eyes had remained dry. His tears flowed for three days for Dr. Bainame. For me it was a touching convergence of my experiences with South Sudanese Lost Boys and this current reality in Botswana. 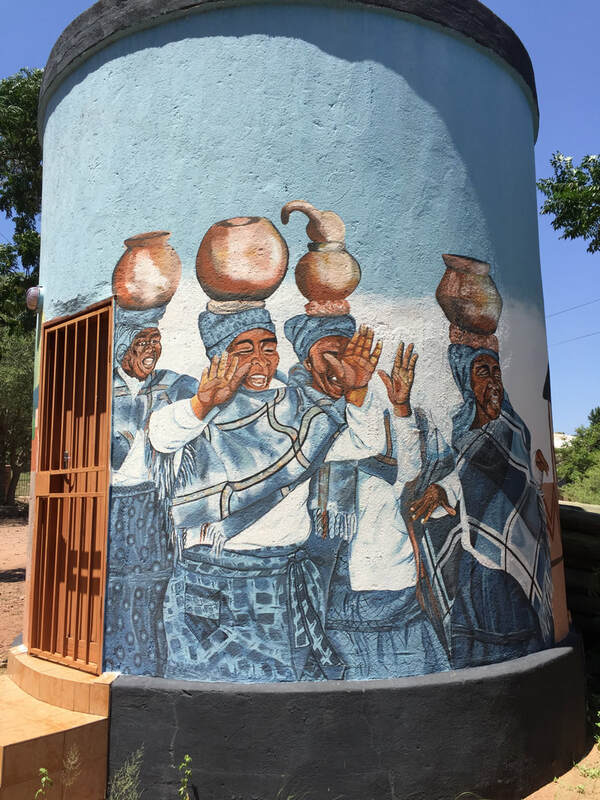 Batswana respect protocol. Protocol for any type of public event usually includes many, many speakers. 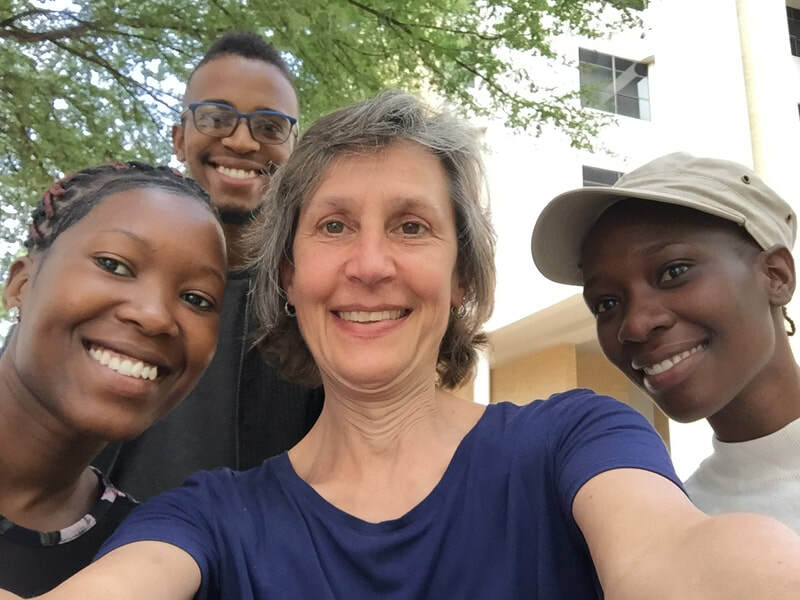 Friday I met several of the other Americans who are here in Botswana on various Fulbright programs at a dinner party at the home of a U.S. Embassy staff member and her husband, who works in international development. 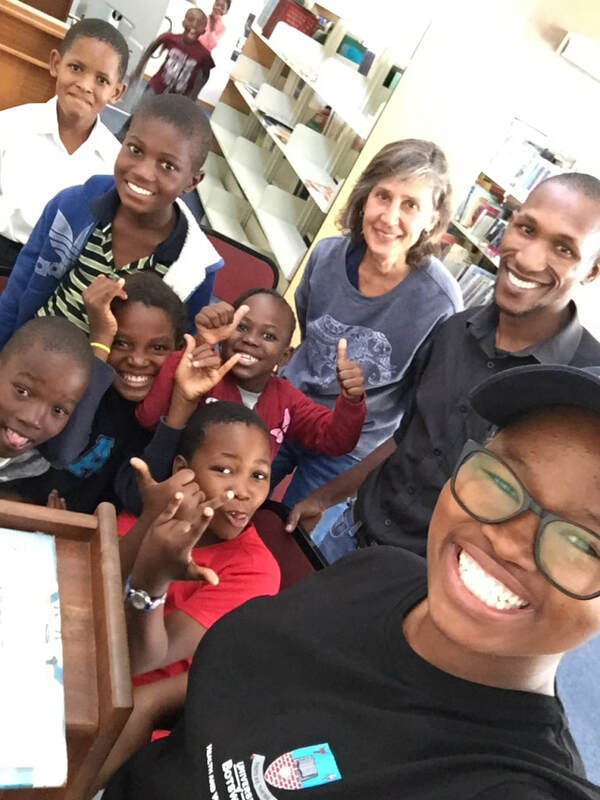 The group included college professors, post graduate students and a former Fulbrighter who originally came to Botswana five years ago and stayed on, co-founding the NGO Young 1Love. 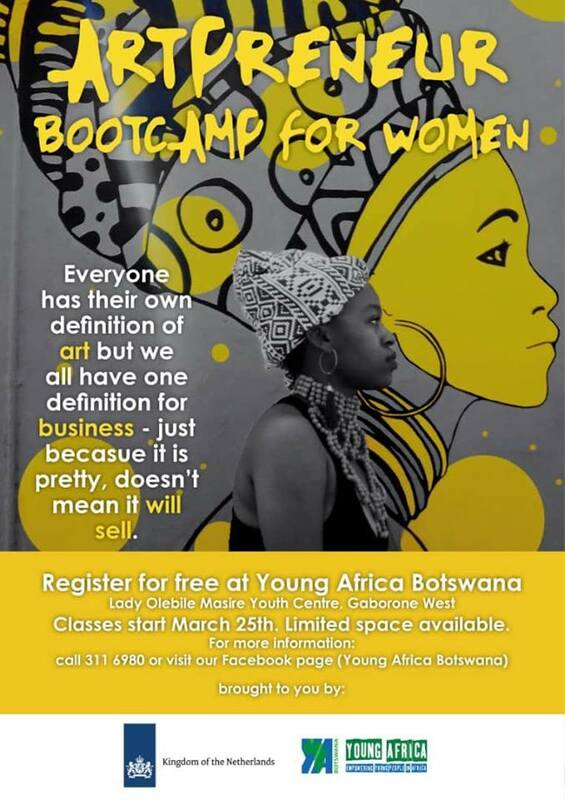 I discovered Young 1Love in 2015 when I read the article What Botswana's Teen Girls Learn in 'Sugar Daddy' Class. It was a fun night of conversation about the ins and outs of Bots and lots of good Mexican food. 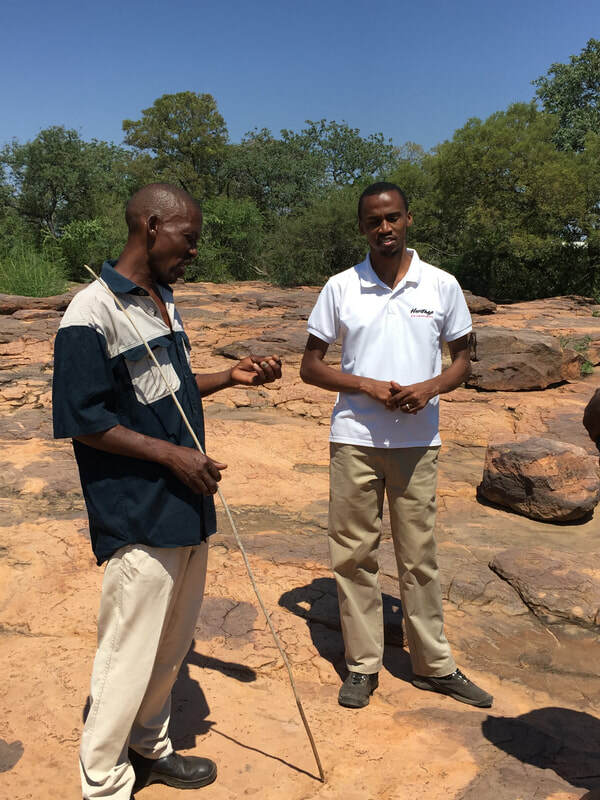 I spent Saturday with Andy from Heritage Adventures exploring some rural areas and villages around Gaborone. 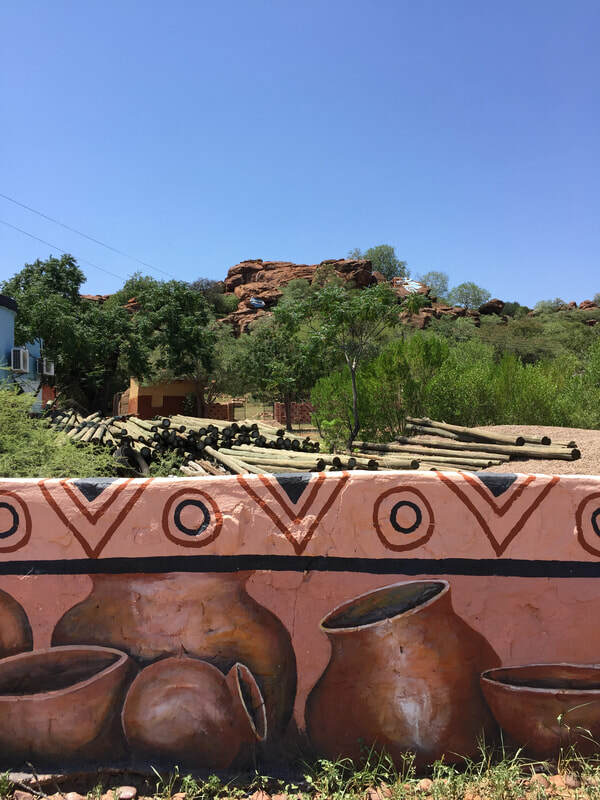 Our stops included the Matsieng Footprints, the village and kgotla of Mochudi and the Manyana Rock Paintings. 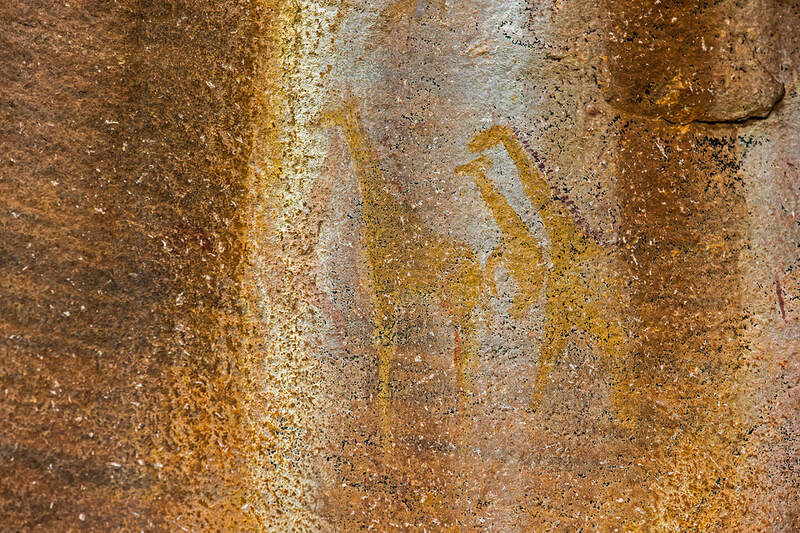 As the legend goes, Matsieng, ancestor of the Batswana, was a one-legged giant who emerged from a hole in the ground leaving a hand and footprint. He was followed by his children and animals. 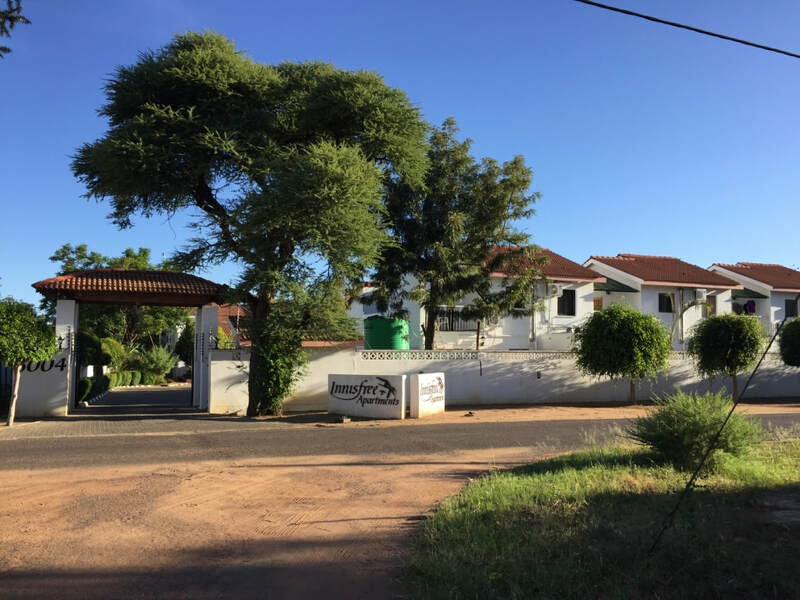 The hours in the car with Andy provided lots of time to talk about his experiences building a small business, Botswana's rural-urban divide and history, culture and social norms. 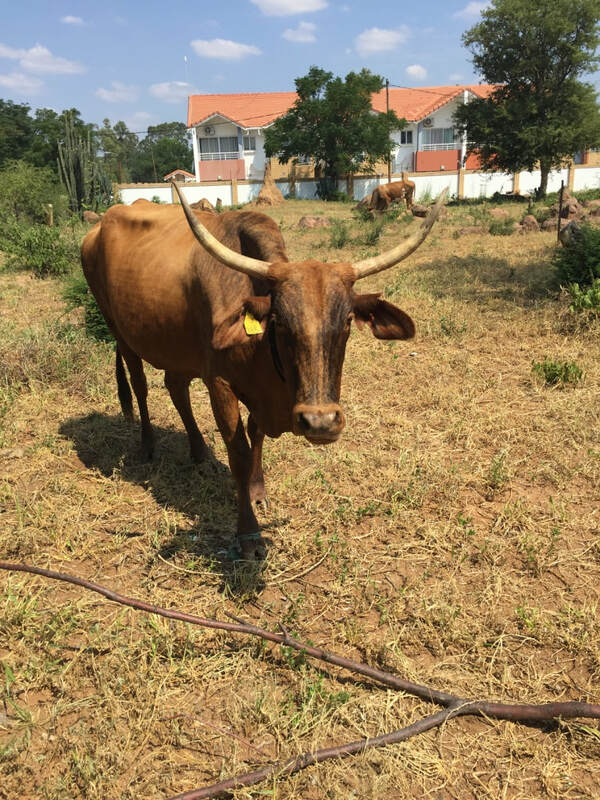 In both the rural and urban areas of Botswana, one sees lots of cows (and goats and donkeys) on the side of the road and in the road. The animals present a real hazard to drivers, especially at night. The owners of the cattle bear the legal responsibility for their meandering. If you hit a cow with your car, the owner has to pay you for the cost of repairs to your car. As we pulled in to the Matsieng Footprints, a cow crossed the road slowly in front of us. As she passed, we were startled to see the head and face of a stillborn calf, hanging from the back of her body. The mother and the baby, one still strong and one so fragile. Actually it was at the end of Week 1 that I literally fell into a hole. Yielding to pedestrians is not really a concept in Gaborone, so while attempting to cross a busy street downtown and looking both ways (the opposite ways that my mind has been socialized to look, as they drive on the left side of the road here), my right foot and leg up to my knee literally fell into a drainage hole and my left knee slammed into the ground. After climbing out, limping home, applying an ice pack and downing some Advil, what emerged was the largest bruise I've ever had, radiating yellow and blue over my entire calf and reminding me that life can change in an instant. Figuratively, I fell into a hole this week due to the challenges of cross cultural communication. It became clear that my Advisor misunderstood the difference between the Fulbright DAT program that I am a part of and the Fulbright Scholar program in terms of the formal vs. informal research called for in my Inquiry Project. It became clear that my Advisor expected me to know what I didn't know yet, which was that if someone doesn't respond to your e-mail, doesn't answer your phone call, you should go to their campus office (if you can find it), knock once, enter and insist that they help you on the spot. I scrambled out of this hole by holding my ground on my Inquiry Project, pestering the ICT office until I gained access to Blackboard for the class I am auditing, marching behind my Advisor to another professor's office to firm up a time to solicit project advice from the Population Studies Department and navigating the informal economy to print a stack of forms in triplicate for UB Ethics Committee approval so that I am able to survey students when I visit schools. It's hard to be reprimanded ("yelled at" my own children would call it, but I always questioned whether anyone had actually yelled at them) by an Advisor who is at least twenty years my junior. Thanks to my Fulbright colleague Tess for letting me vent and empathizing. Maybe it's because she has a 7 month old and 3 year old at home, child care complications and the Department Chair just informed her that she is to teach an additional class this semester. Thursday I attended a seminar hosted by the UB Economics Department entitled Determinants of Youth Unemployment and Localising SDGs: Case Study of Gabone in Kweneng District. Contrary to stereotypical beliefs about technology integration in the developing world, the community census that formed the foundation of the study was carried out on handheld tablet computers that geolocated respondents and fed data into GIS maps. Yay geography! 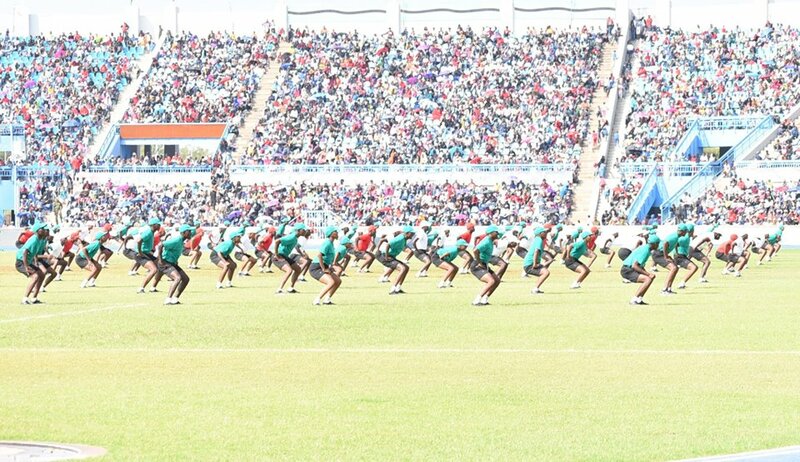 It is clear that the most daunting challenge related to Botswana's "youth bulge" is high youth unemployment. In the community this study focused on, youth unemployment is 26%. 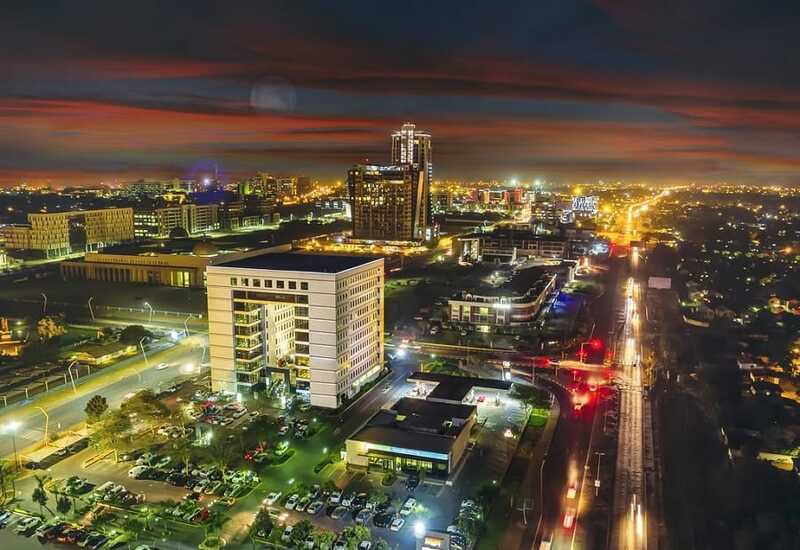 This is commonly attributed to a mismatch in Botswana's labor market. Current employers demand low-level skills, while educational and training institutions are producing people with high-level skills. Despite the struggle of finding work equivalent to their skills, young Batswana are reluctant to emigrate. My conversation with the Population Studies professor whose article Patterns and Differentials of Migration in Botswana we read and discussed in class (he himself migrated here from India), meshed with anecdotal evidence suggests that young people just really like it here in Botswana, so they try to manage. Managing means "the hustle". Civil engineers drive taxis, social entrepreneurs trying to get NGOs off the ground sell sweets, fat cakes and mobile phone airtime on the street and the young man who greets me each morning at the gates of UB bought a generator and a couple of old desktop computers and printers. For 50 thebe a page (a little less than 50 cents) he prints, collates and staples anything you need (ah yes, those Ethics Committee forms in triplicate). He's there at 6:30 a.m. on weekdays and usually has a line of people waiting. 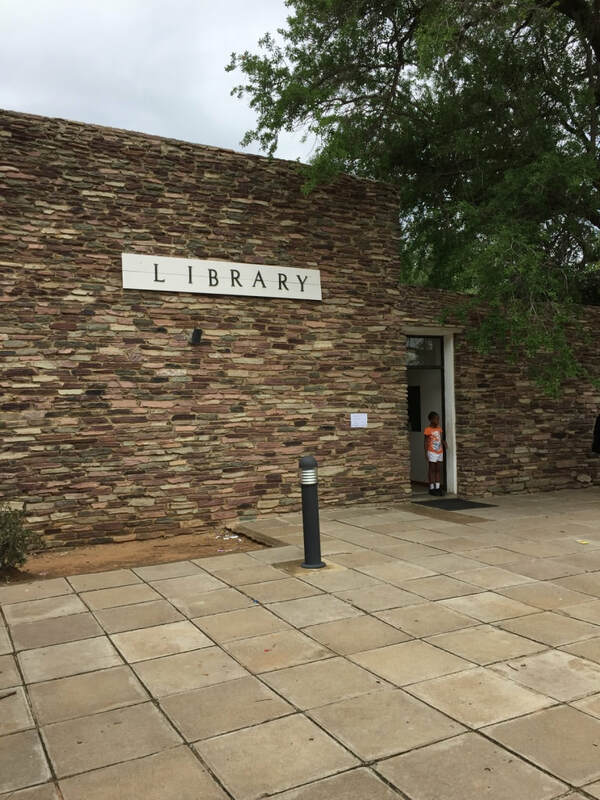 Last week I mentioned I would be attending a SDGs seminar for youth at the Gaborone Public Library. That session ended up being cancelled, but yesterday's session was a go. 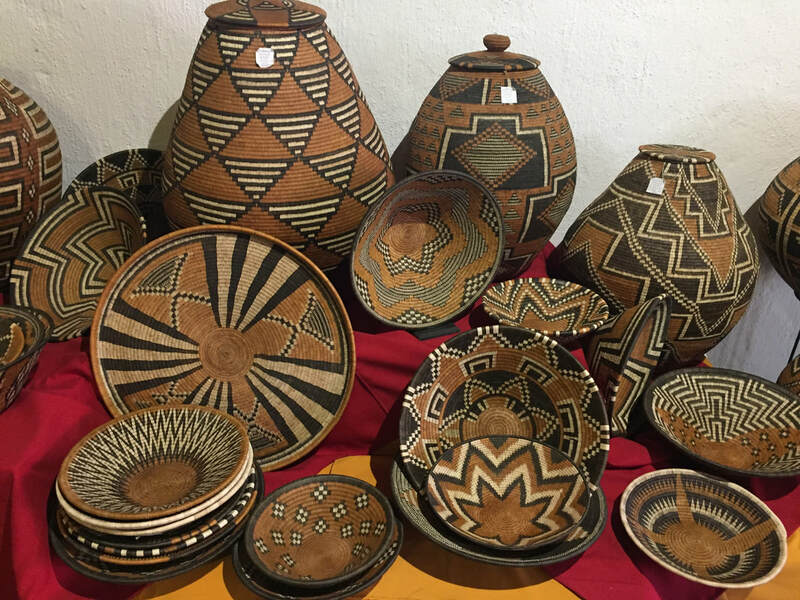 Together with like-minded friends Tebatso Jokonya founded Banabakgwale Association in 2016. Their mission is to help youth gain skills so as to to be able to create sustainable businesses, particularly in the agriculture and tourism sectors. 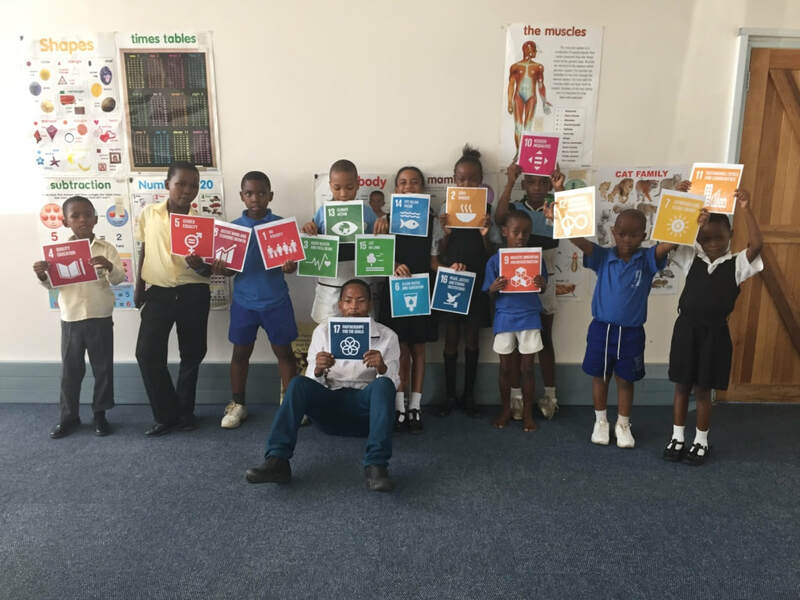 They raise awareness of the Sustainable Development Goals and reach out to primary and secondary schools to offer computer training to both students and staff. 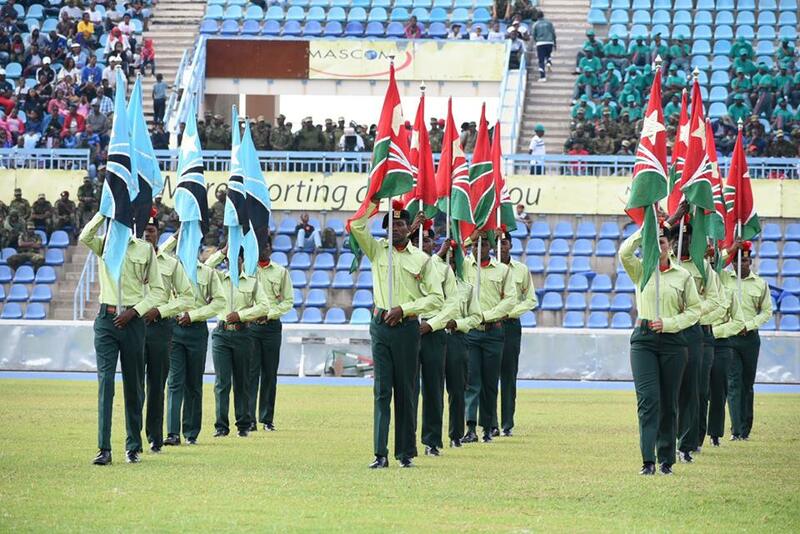 Inspired by Botswana's Vision 2036 and the African Union's Agenda 2063 and affiliated with the U.N. 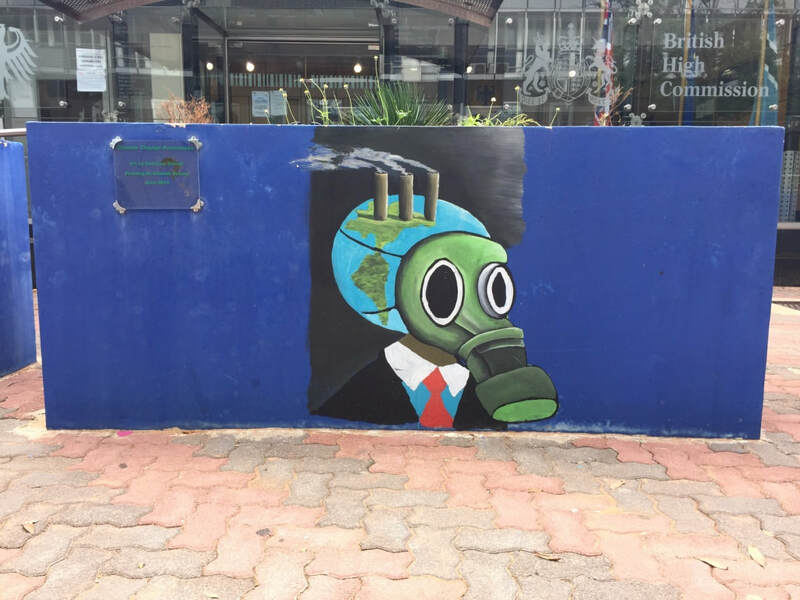 Global Compact and U.N. 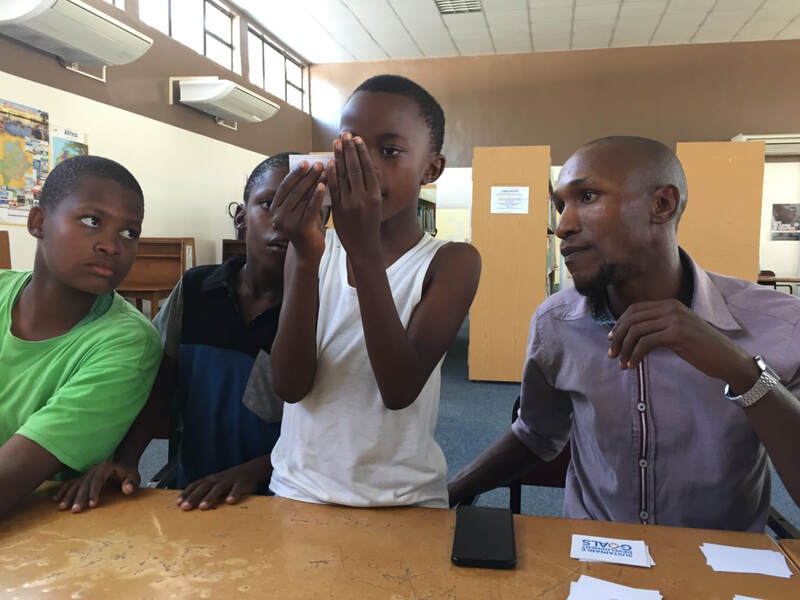 Youth Envoy, Banabakgwale ("birds of a feather flock together" in Setswana) connects students and teachers to things like Microsoft Digital Literacy Courses, Africa Code Week and World ICT Day. 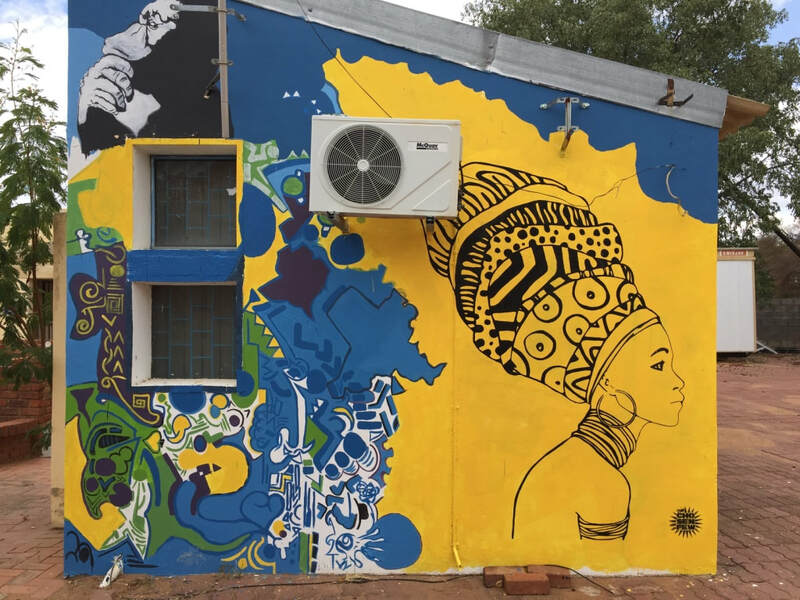 One of Tebatso's ideas was to capture the attention of Gaborone kids who spend their after school hours at the public library. Kids walk there when school lets out, do homework and read books until it is time to walk home or their parents pick them up. 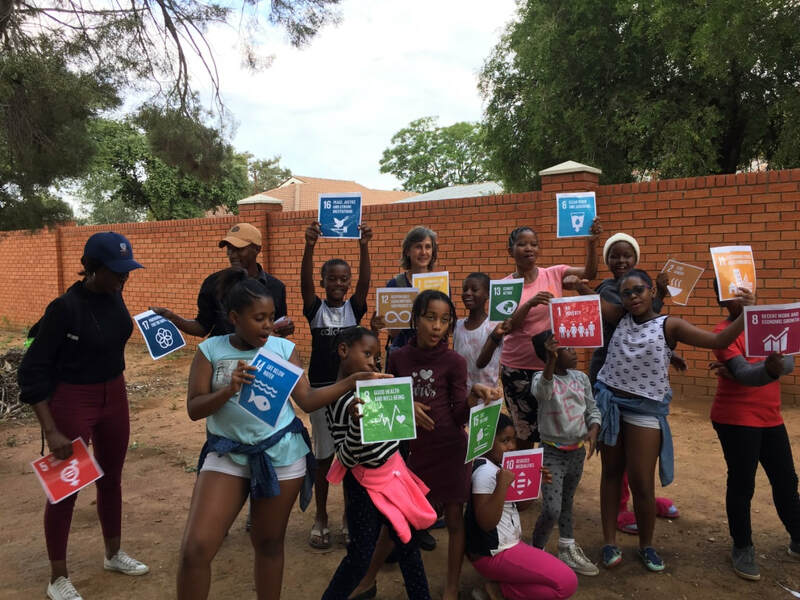 So, most Friday afternoons, he gathers the kids that happen to be there and shares information about the Sustainable Development Goals (SDGs). Sometimes he uses resources from the World's Largest Lesson. 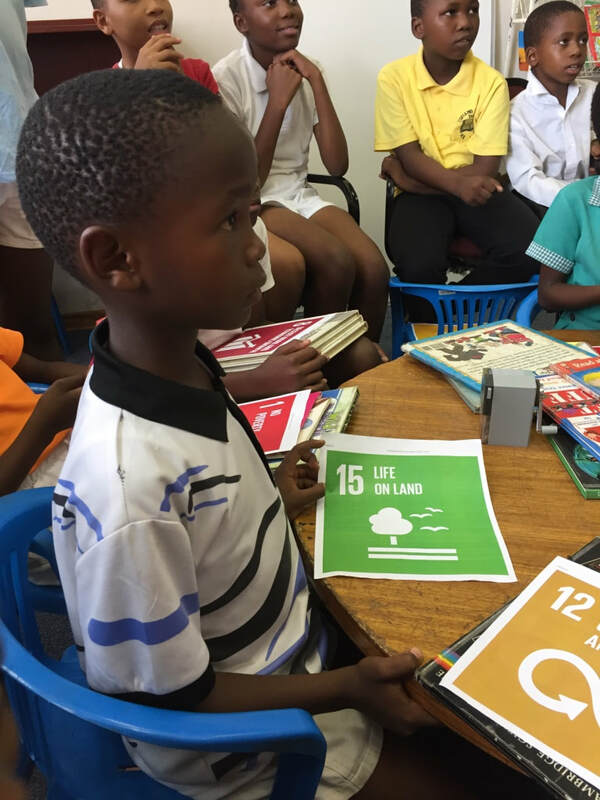 Yesterday, each child received a color copy of one of the 17 Goals, also called Global Goals. They practiced reading the goals in order, out loud. The older ones helped the younger ones and Tebatso explained the meaning of each goal in Setswana and English. During a second round, as each child read their goal, Tebatso distributed small sweets, instructing the children not to eat them. The number of sweets that each child received varied, with some receiving up to four and some receiving none. This segued to a more in-depth discussion of different types of societal inequalities. By the end of the session, every child had at least one sweet (I kept thinking of the Stanford psychological experiment on delayed gratification where they see how long kids can wait to eat a marshmallow) and Tebatso finally gave permission to eat. I don't want to make too many assumptions based on one meeting at which the kids were all aware a U.S. teacher was joining them, but I was a bit amazed that kids were so cooperative and engaged. 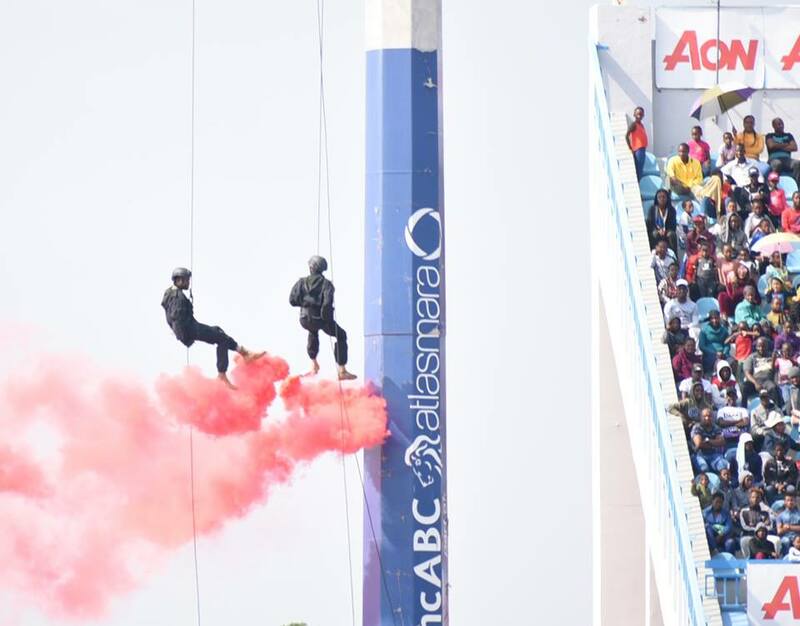 This is not an after school activity that they signed up for in advance or that their parents paid for them to participate in. 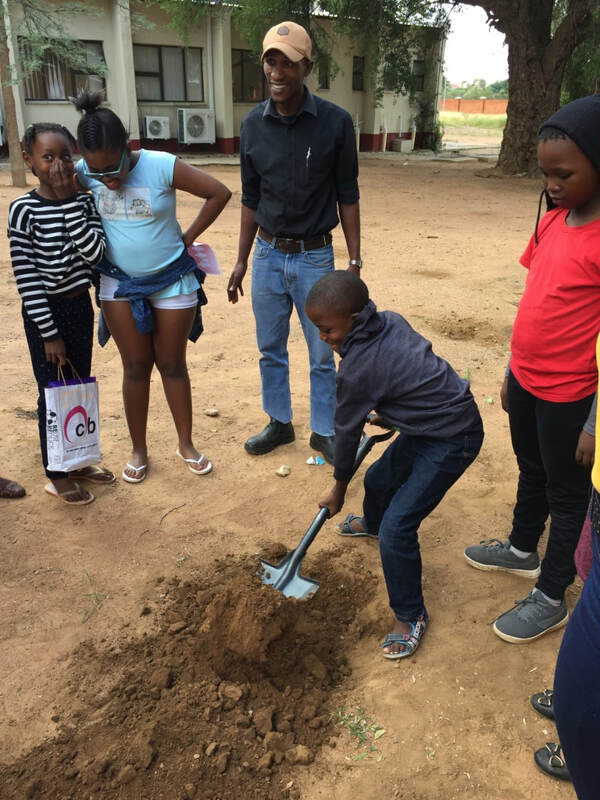 It's just a young guy introducing kids to something he is passionate about and hoping that when they go home they continue the conversation with their parents and friends. This week I'll be meeting with more NGOs including Green Habitat Botswana and YALDA Botswana, possibly connecting via Skype with Bernard Onyango of the AIFEP (African Institute for Development Policy) in Kenya, trying to arrange appointments to visit private schools while waiting for permission to visit public schools and cracking open reading material given to me by Population Studies professor Rebecca Kubanji, who serves on a committee charged with disseminating information to the public about the demographic dividend and Sustainable Development Goals. 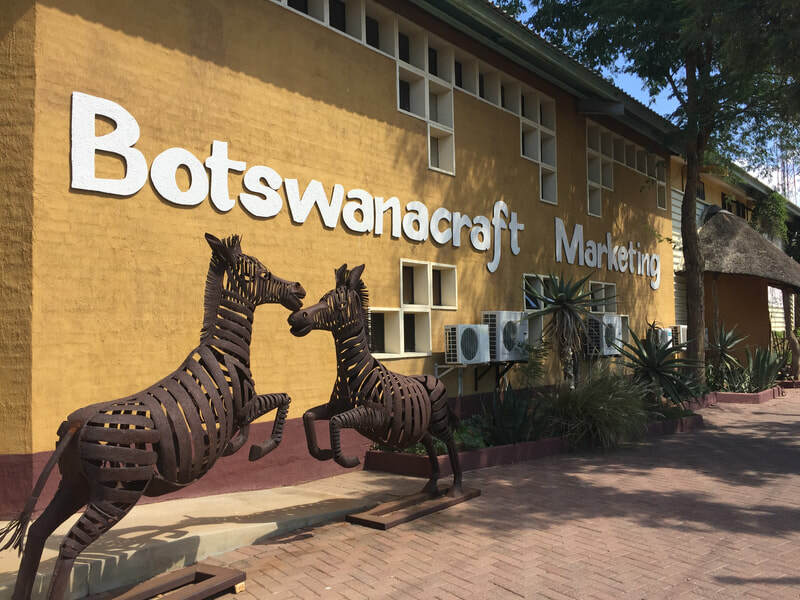 Rebecca also offered to help arrange meetings with representatives of the Botswana Ministry of Finance and Economic Development and the United Nations Population Fund, major players on the issues I am studying in Botswana. 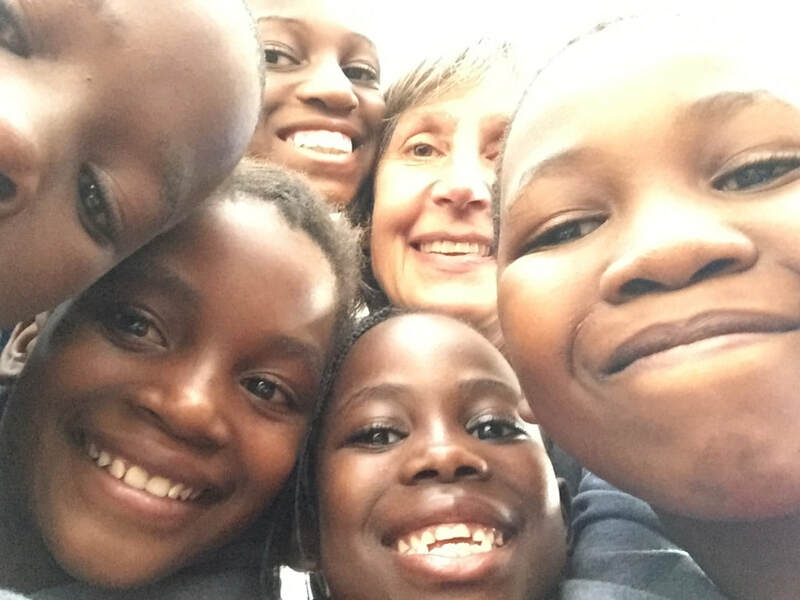 A 9th grade AP Human Geography and Global Studies teacher at Stillwater Area High School in Stillwater, Minnesota, USA, living and learning in Gaborone, Botswana from January to June 2019 as a Fulbright Teacher. 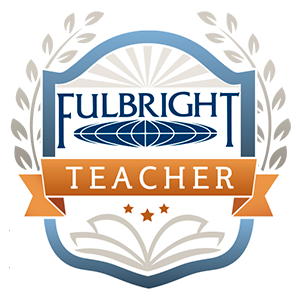 Disclaimer: This site is not an official site of the Fulbright Distinguished Awards in Teaching Program or the U.S. Department of State. The views expressed on this site are entirely those of its author and do not represent the views of the Fulbright Program, the U.S. Department of State or any of its partner organizations.